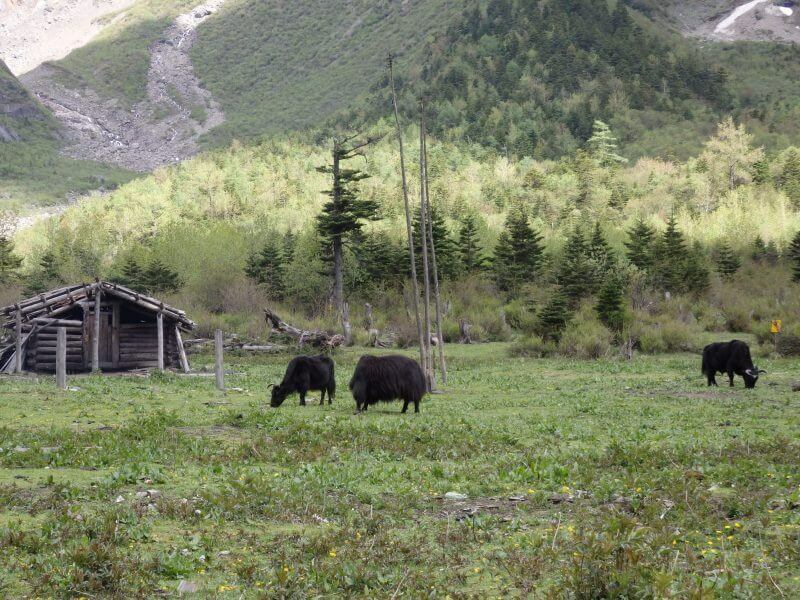 Somewhere at the Yunnan/ Tibetan border, probably not too far from the eastern end of the Himalayas, lies a hidden village, once so obscure it was once considered mythical. 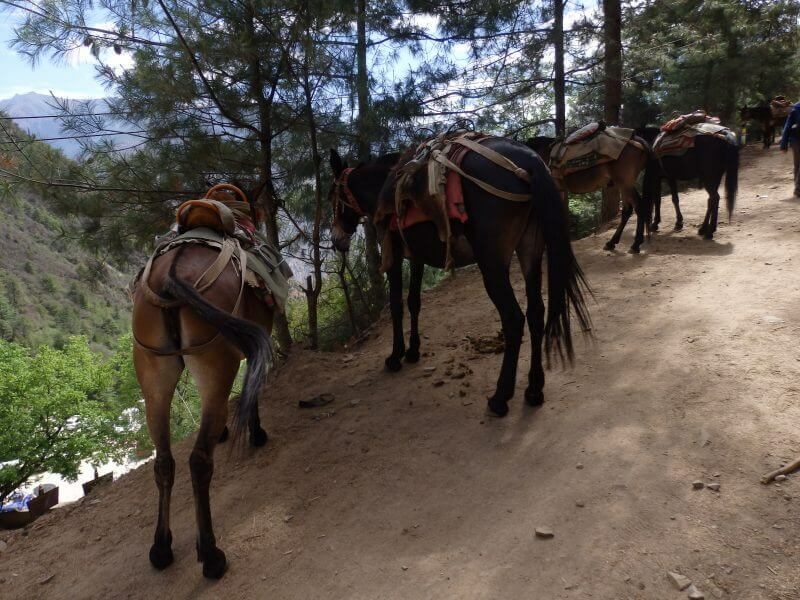 It’s possible to reach Yubeng on foot today, or if your wallets allow, on donkeys too, but those are probably the only two ways to get into this lost paradise nestled deep within one of nature’s best pieces of art. There weren’t many accounts on Yubeng available online while I was doing my research, I just had to see it for myself. 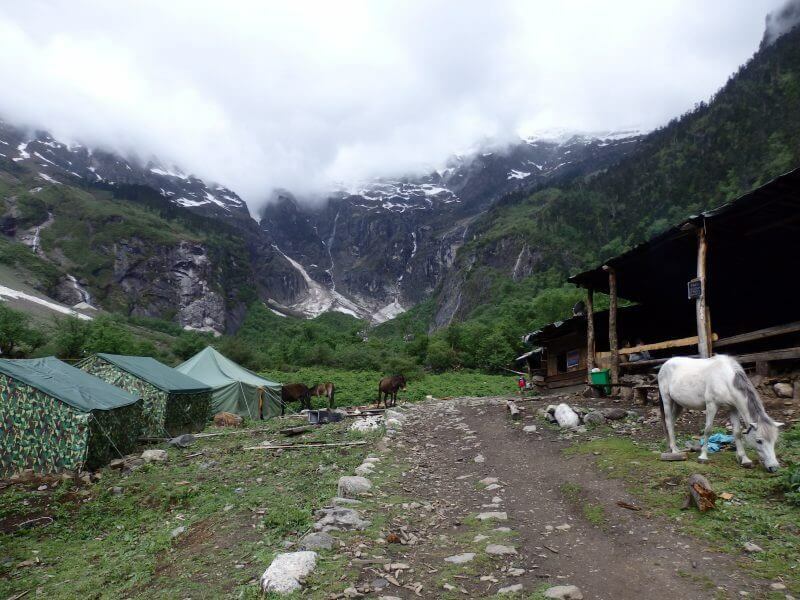 Kawagebo Base Camp, on the hike from Yubeng village to the Glacier Lake. 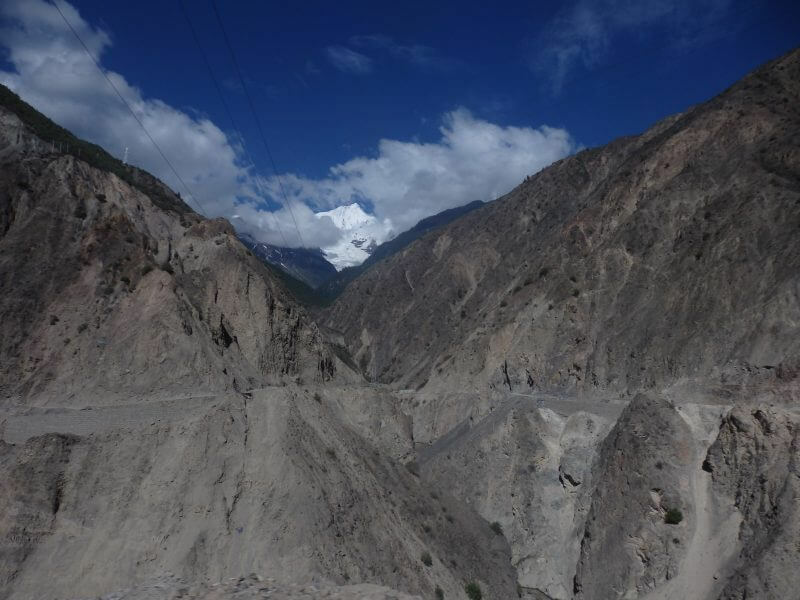 By now I’m fast running out of superlatives to describe my journey, but the trip to Yubeng was absolutely stunning (and at times really terrifying). 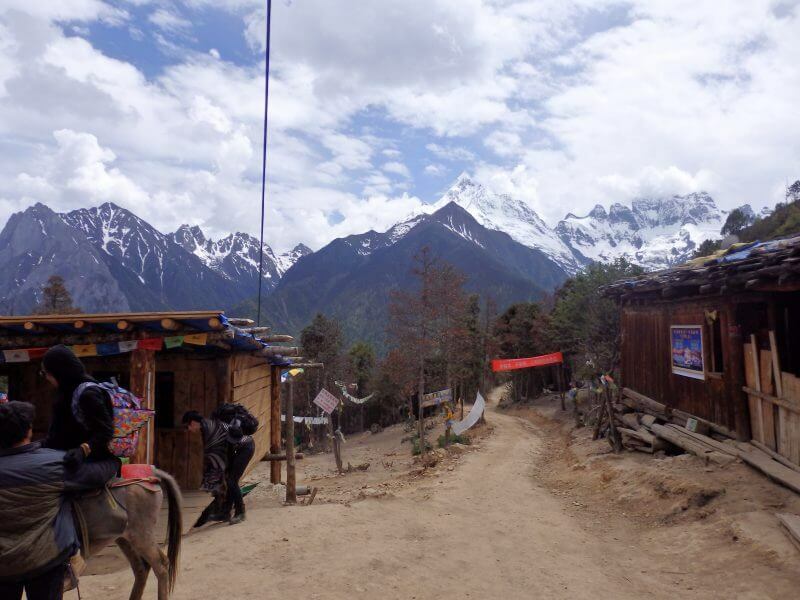 Fortunately this was my last destination in the Yunnan highlands before returning to city life as I probably won’t have any words left to describe anything further up north (Tibet, Qinghai, Xinjiang). Note- this leg does not contain any summit attempts (illegal, and I’ll probably not survive any such attempt), but is made up of a couple of scenic hikes through slightly mountainous terrain to various points of interest. 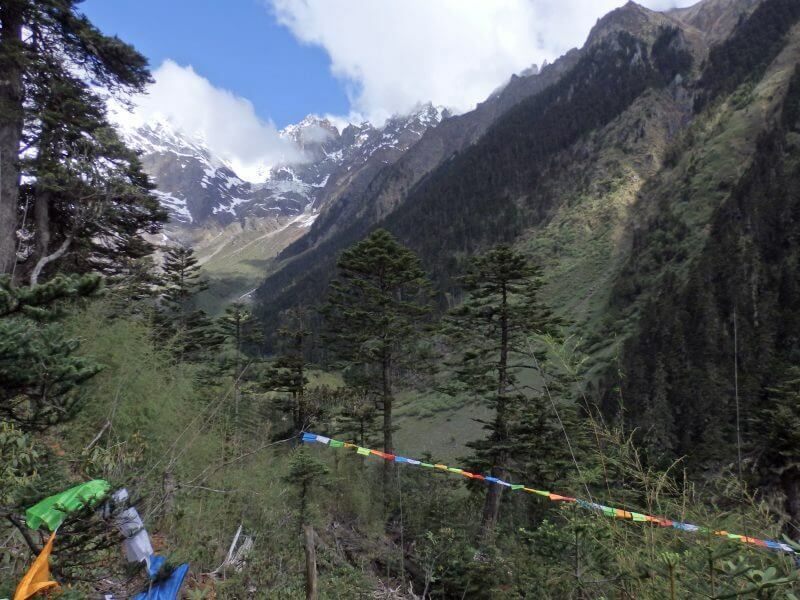 2 days before I was to start my journey towards Yubeng, I was hit by a sudden bout of altitude sickness. 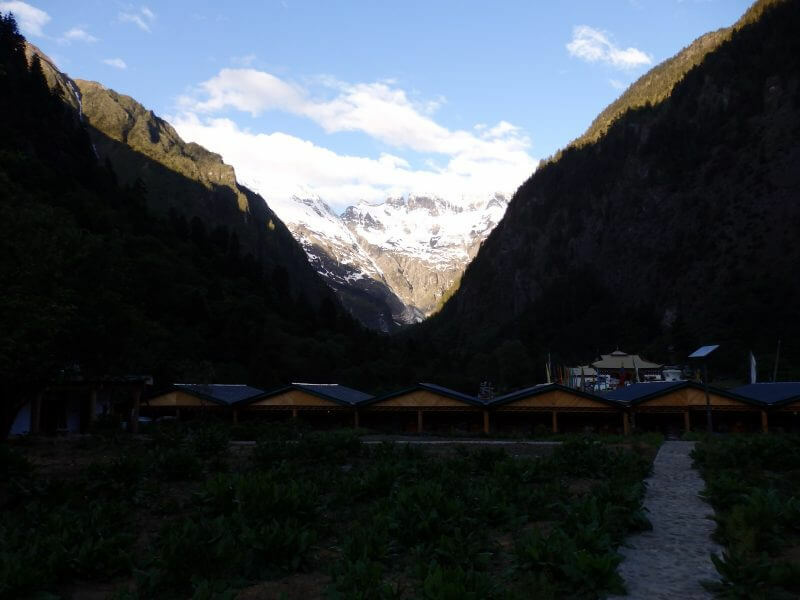 I had spent 2 weeks in Yunnan without issue but somehow something went wrong at Shangrila, starting late in the night I arrived (might have been the excessive Yak butter tea during dinner), with endless puking trips to the toilet and my head spinning throughout the night. I was fortunate that my good friend had joined me for this leg just a few days before, and really thankful that he brought me to the hospital for a drip the next morning, which after an hour lightened stuff a little. I spent the rest of the day resting, probably my first full day off since leaving Singapore over 2 weeks back. 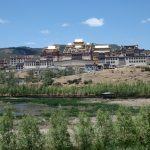 Miraculously felt good enough for the hiking trip to the mountains 2 days later, and so my Yunnan adventures continued, to the northernmost and final stop in Yunnan, almost touching Tibet. 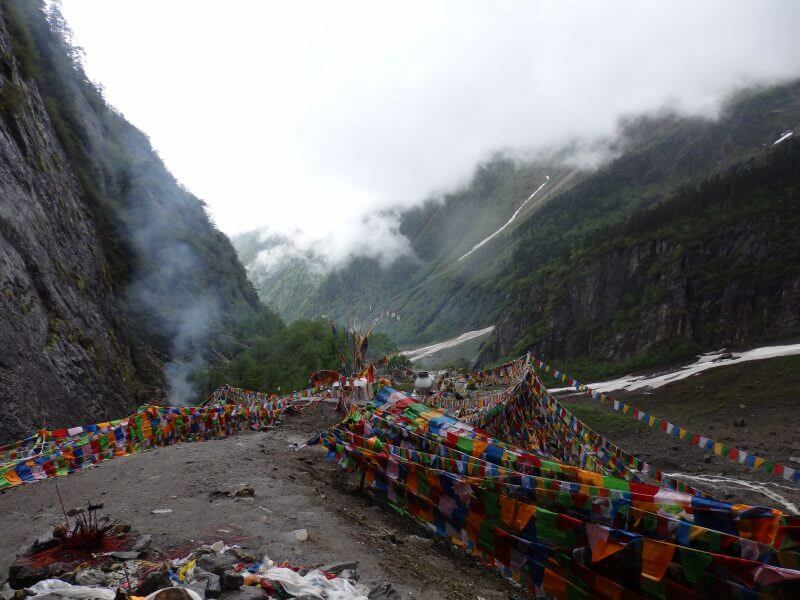 We left our larger bags at the Shangrila hostel and brought just the essentials – amounting to a small backpack each. Can’t imagine how we would have survived if we hadn’t done so. It wasn’t that difficult but my fitness isn’t in that great shape either. 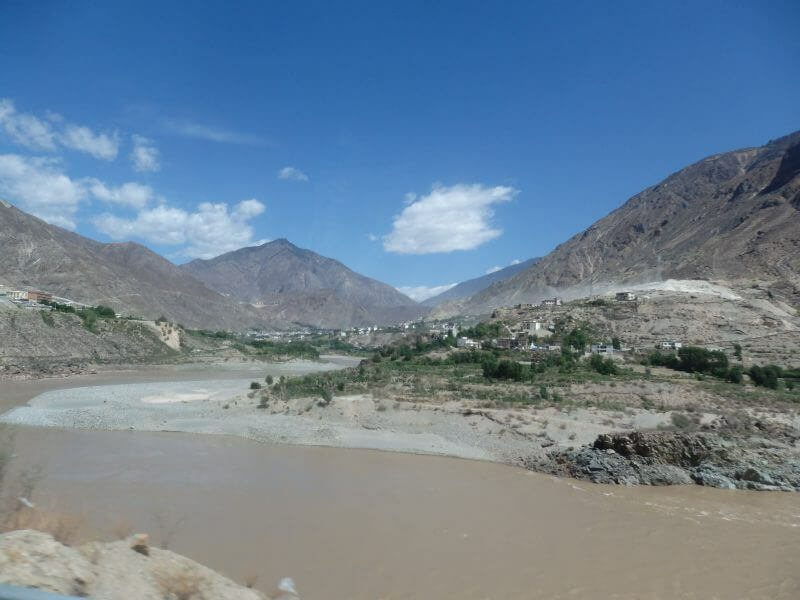 Not long after we boarded the bus from Shangrila heading towards Deqin, we were passing huge grass plains, and after the plains, the landscape suddenly became much rawer and barren, as we climbed into the mountains. 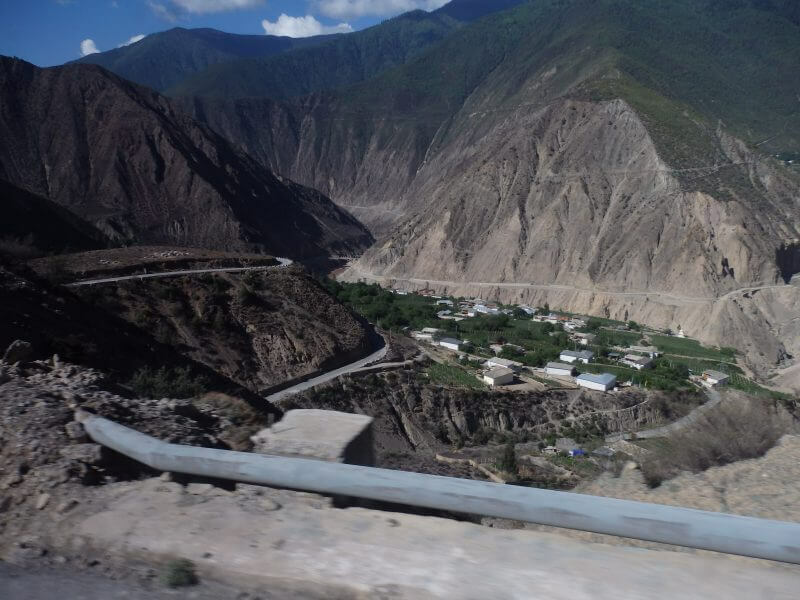 En route to Deqin (from Shangri-la/ Zhongdian). Lunch stop with a view. The bus climbed higher, the landscape grew more dramatic, but the bus showed little sign of slowing, and the ride got a little more perilous. 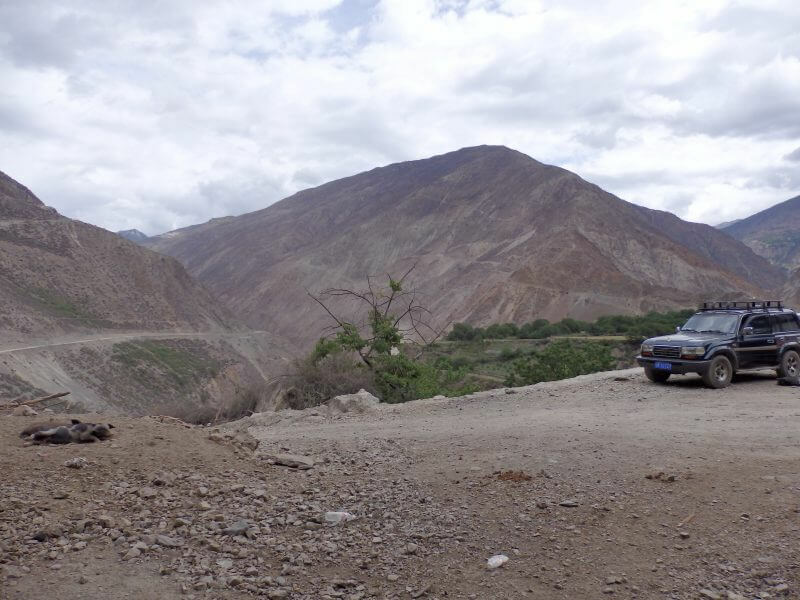 Barren terrain and mountain roads. Nevertheless, the view from the bus was a real treat. 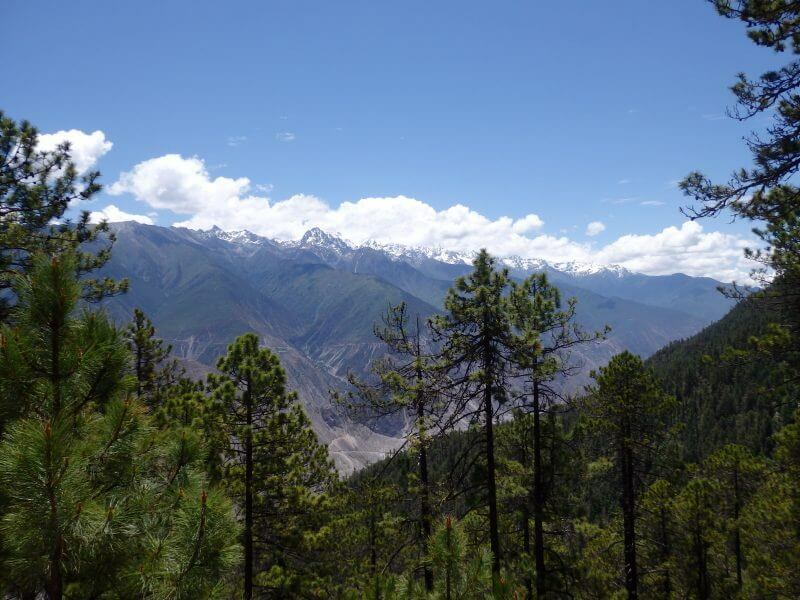 Snow-capped peaks and lush forests. Right out of the bus. 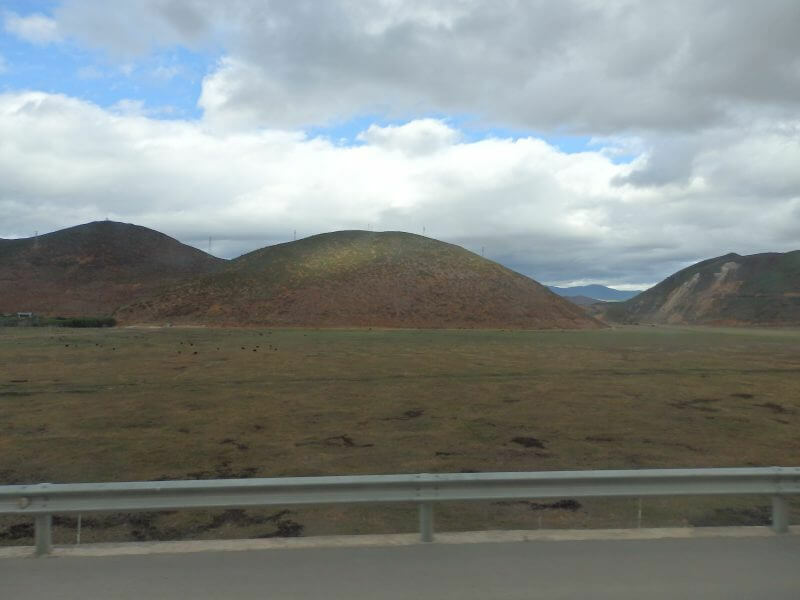 Dramatic rock formations along the highway. A high point of this trip, in every sense of the word. 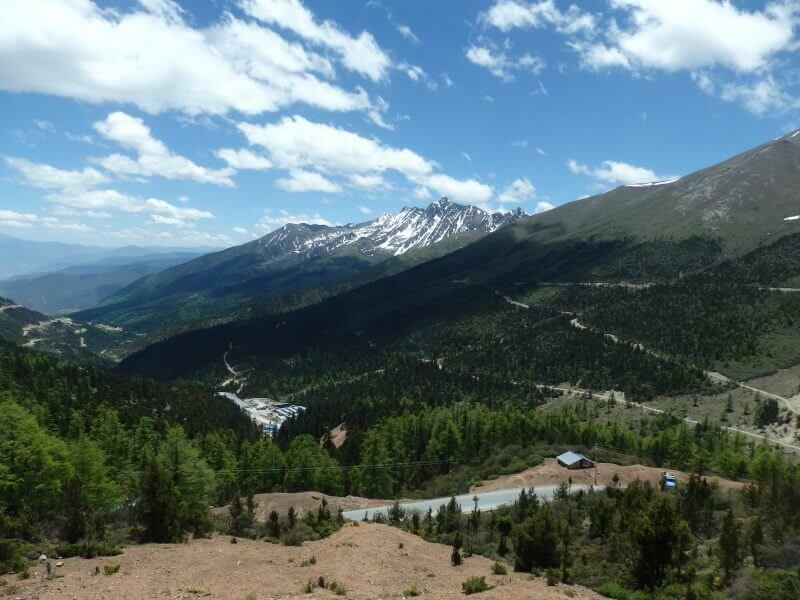 The highway climbed to well above 4 kilometres above sea level, to the highest point at the Bai Ma Snow Mountain (Baima Xue Shan). 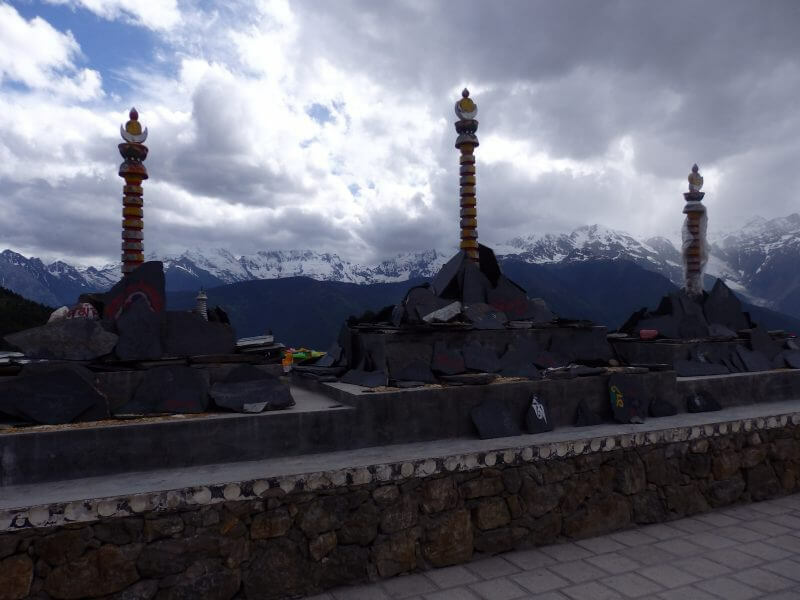 Highest point on the highway from Shangrila to Deqin, at Baima Snow Mountain – 4,292m. Roads winding along the side of the mountain with steep hairpins, reminiscent of the route to Pai. 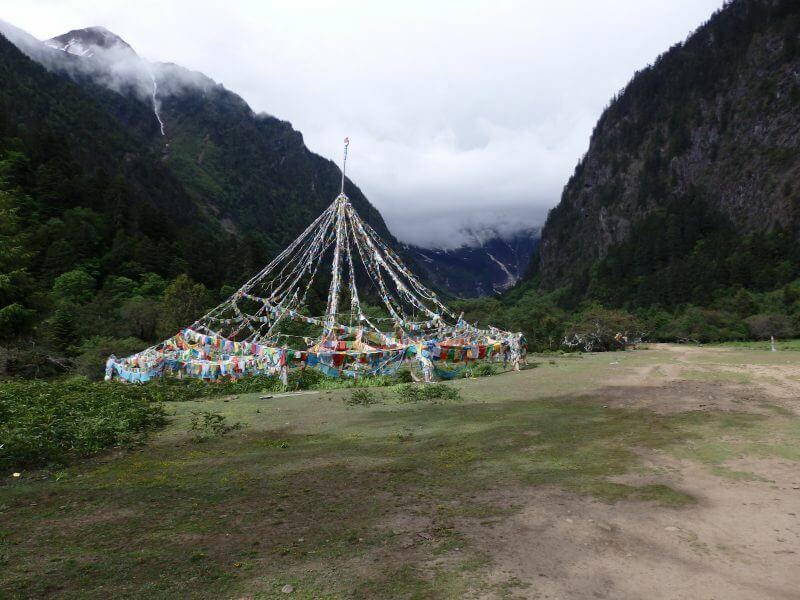 After a couple of hours going round and round the mountains, we arrived at Deqin, where a smaller bus was waiting for passengers transferring to Feilaisi (Feilai Temple), a small district surrounding a temple where most hikers spend the night before beginning the trek to Yubeng the next day. 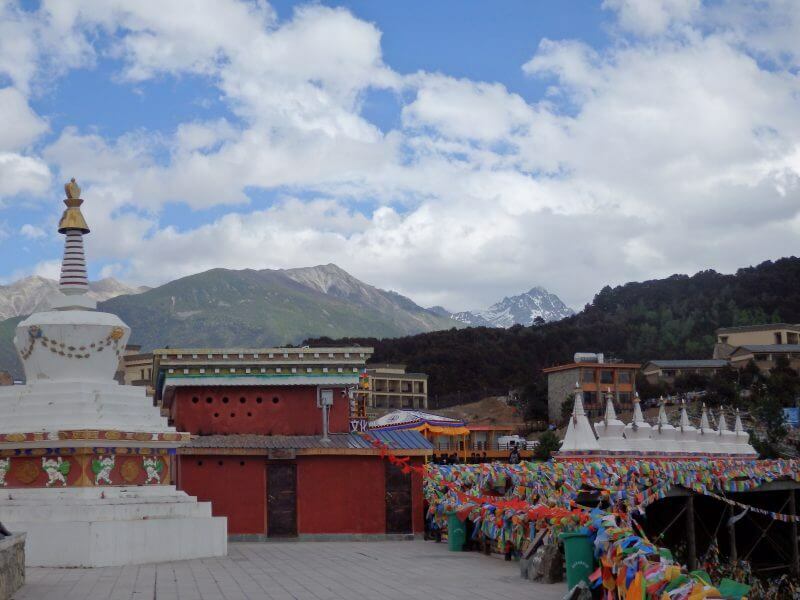 At Feilaisi, the stunning snow-capped peaks behind the temple walls. 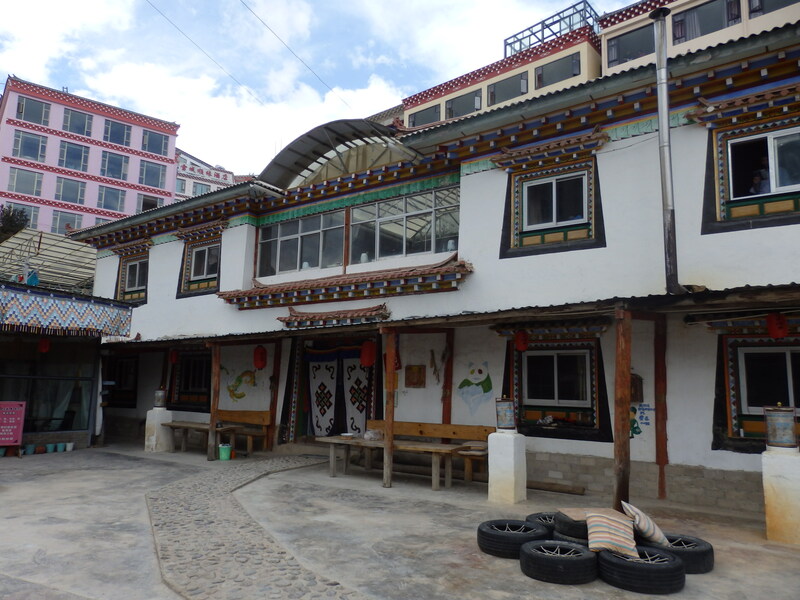 Our hostel at Feilaisi. Decent overall, but sanitation was lacking. Flushes ran out of water the next morning and it was a ghastly sight. After checking in, we visited Feilaisi, a temple built on the edge of the mountains (¥230 admission ticket, includes Yubeng and a few other places, can’t be bought separately). 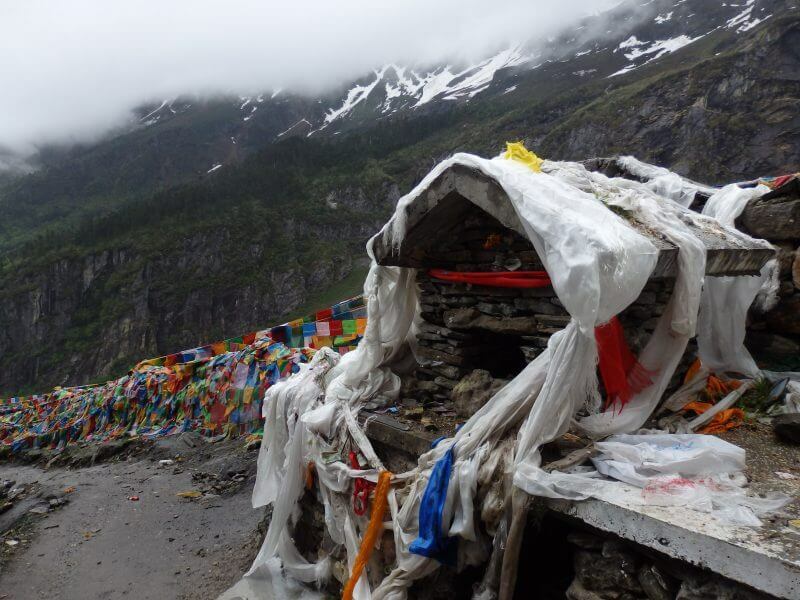 Feilaisi (Feilai Temple), a temple built on the edge of the Meili Snow Mountains (Meili Xue Shan). 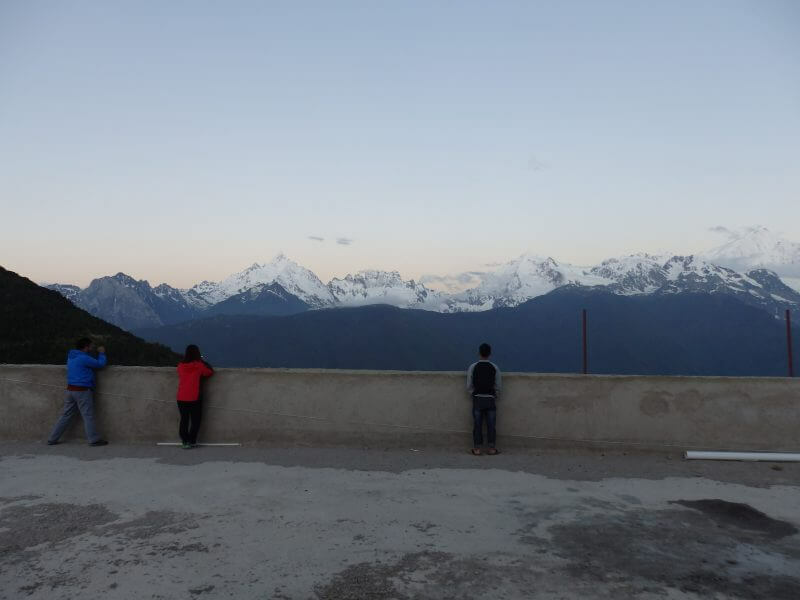 The viewing deck at the temple offers amazing views of the entire Meili Snow Mountain range, a group of sacred Tibetan mountains reaching over 6,000m above sea level, not far from the Himalayas (but probably not walkable either). 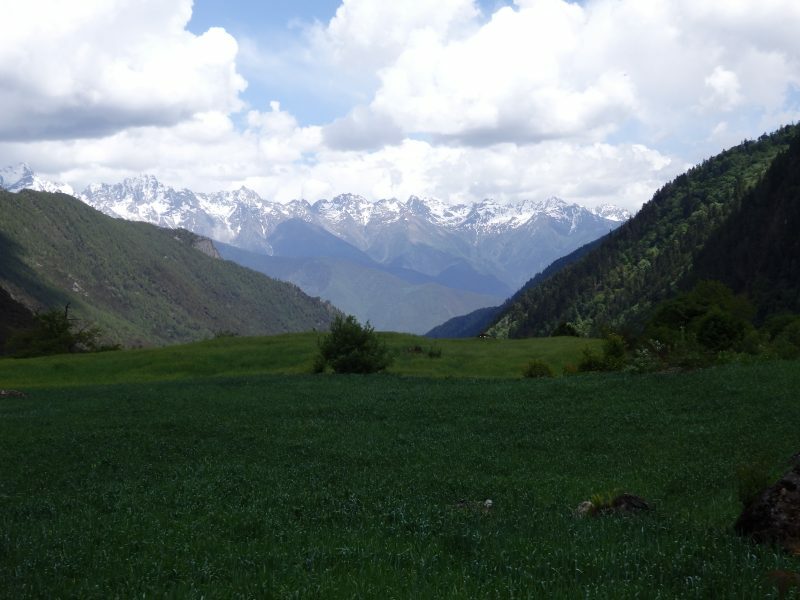 The surrounding mountains are sacred grounds, and till date no one has successfully made it to any of the major summits. 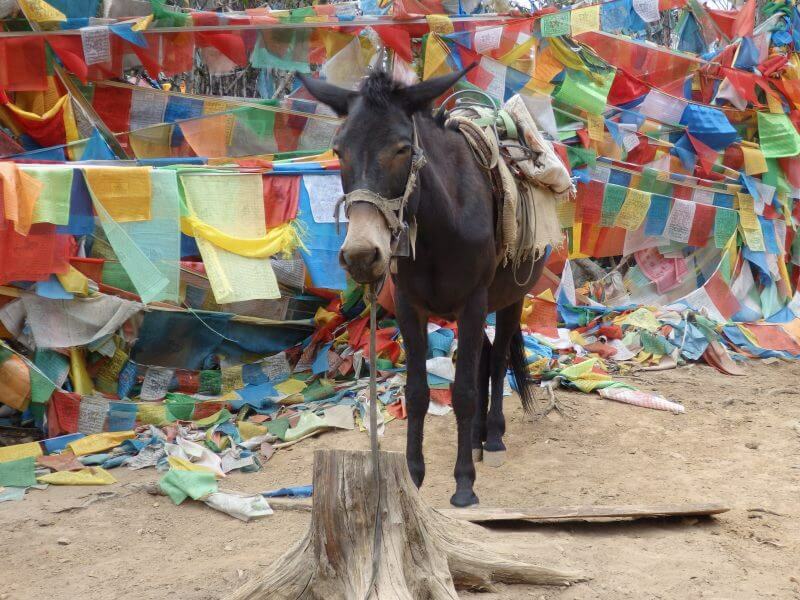 Got some supplies from the minimarts outside the temple, had an early dinner at the hostel restaurant before turning in early for the night, as the following day was to be a long one. 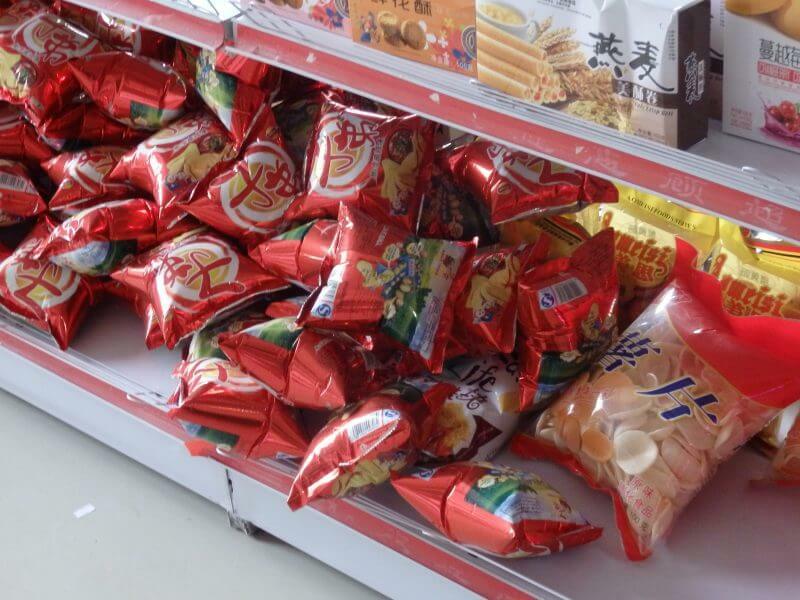 At that altitude (3,300m), everything look like they may explode anytime. 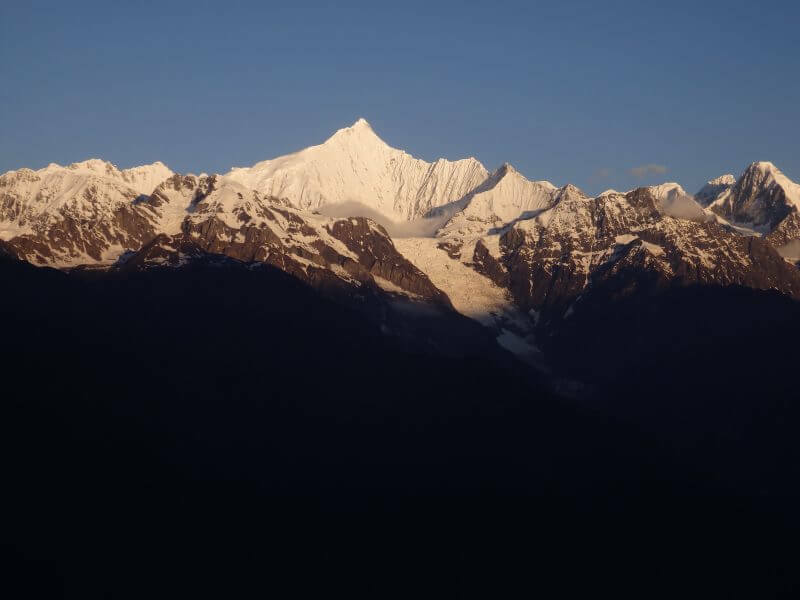 The next morning, we woke up around 6 to catch the legendary magical sunrise, the descent of the first rays of light upon the Meili Snow Mountain range, which travellers in this direction have been so fervently talking about. 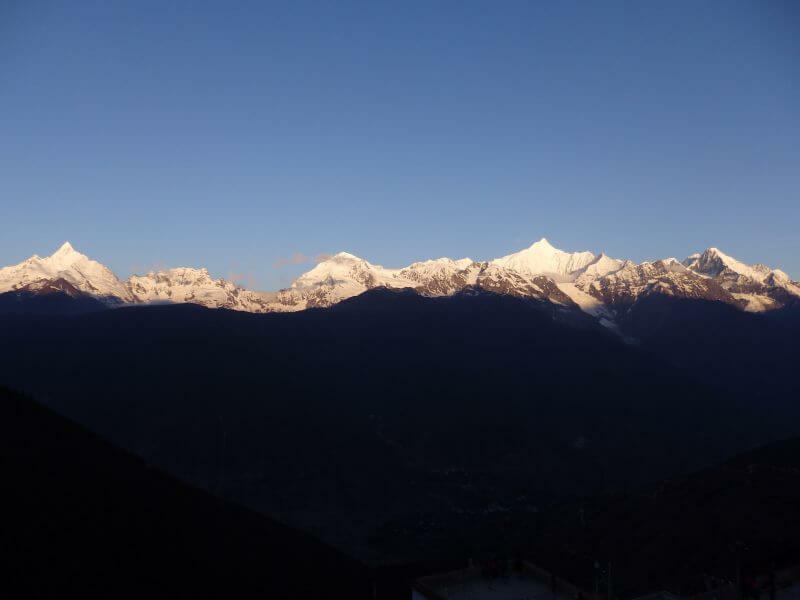 Woke up at 6am to catch the first rays of sunlight falling upon the sacred mountains. Sun’s not yet risen, but we were ready for it. There was a signboard outside the Feilai Temple with the daily sunrise timings throughout the year, so we made it well in time to catch the sunrise in it’s full glory, with the great weather (no clouds and not too much wind, but chilly nonetheless). Found a great vantage point atop a building under construction. Was particularly chilly at 6 degrees. Finally, after a shivering few minutes spent waiting in our pyjamas on the roof of a building on construction, the long anticipated first rays of light, with a term given to it by the locals ‘日照金山’, which describes how the rays of light appear to turn the snow-capped peaks into gold. First rays of a new day! 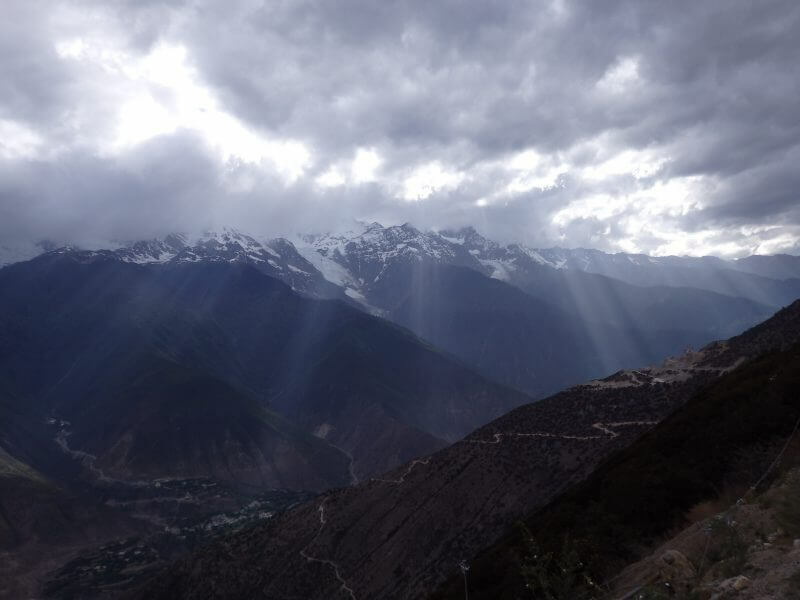 The Chinese call it 日照金山 (sun shines on the golden mountain). 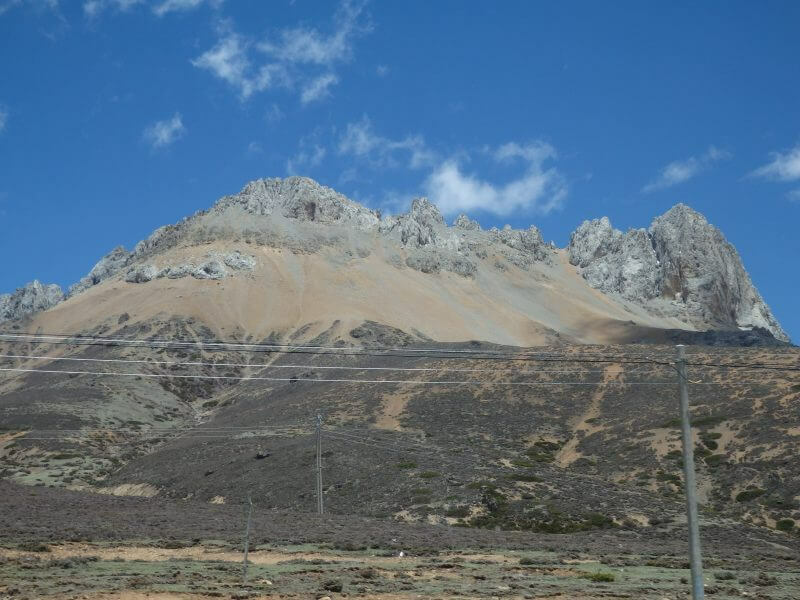 One of the peaks must have been the (in)famous Kawagarbo (6,740m), which claimed countless lives before climbing was banned in 2001. 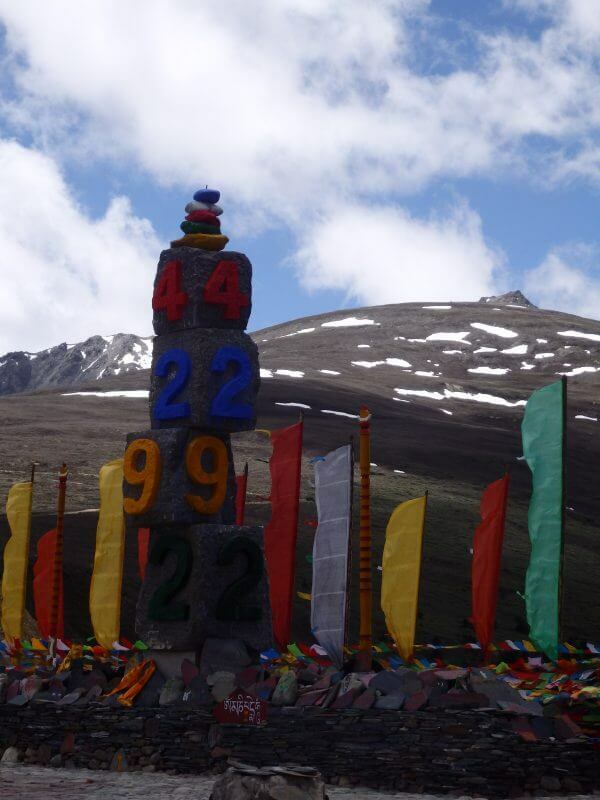 Tibetans believe the peaks are sacred and if humans were to set foot on the summits, disaster will follow. 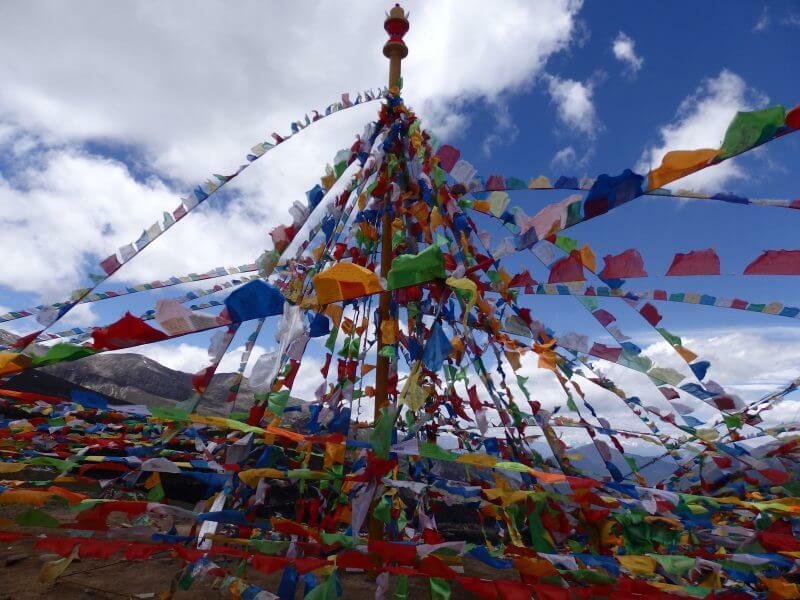 Attempts have been made in the past despite protests and warnings from Tibetans. The most well known summit attempt was probably the deadliest one, where a full team of 17 expedition members were killed in an avalanche in 1991. 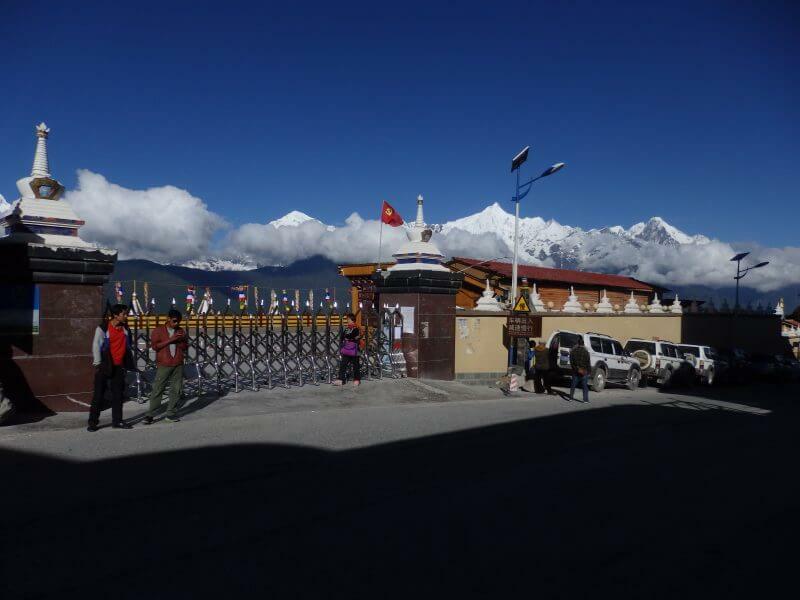 Can’t identify the peaks but I think this is Kawagebo/ Kawagarbo, the sacred Tibetan peak 6,740m above sea level. 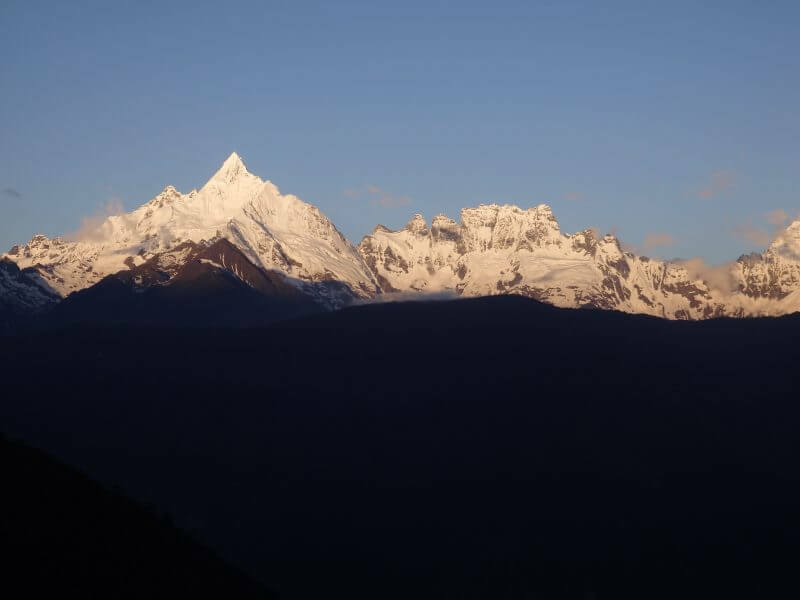 As the sun rose higher, the glistering gold peaks slowly turned into sparkling white peaks. 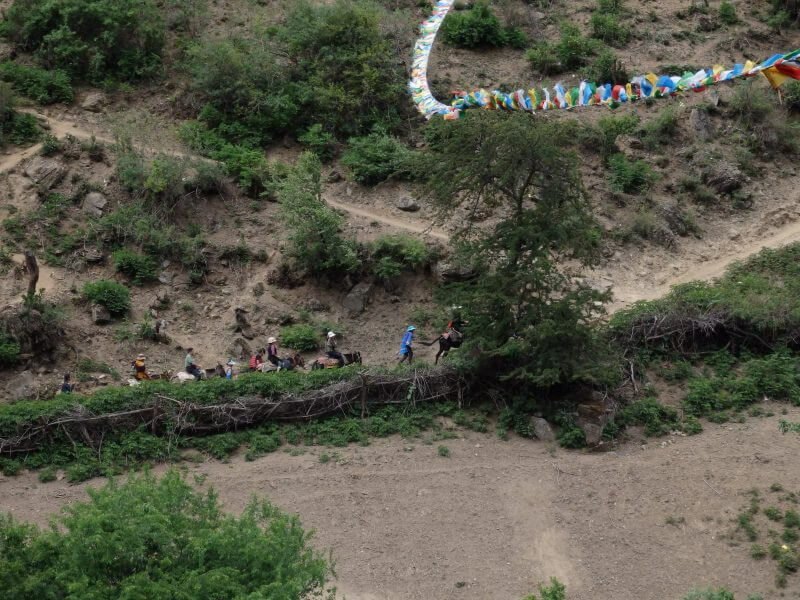 After breakfast, we waited outside the temple for other hikers to share transport with to the start of the trail at Xidang. Charges are by vehicle (4wd cars), regardless of passengers (probably 4 max) and I think we were a little late as it took us quite awhile to find a few more people. Waiting for transport outside the Feilai Temple. The ride down to the valley, though short, was nothing short of terrifying. The driver looked a little too casual for a steep drive down a road barely wide enough for the car, with no guard rails. 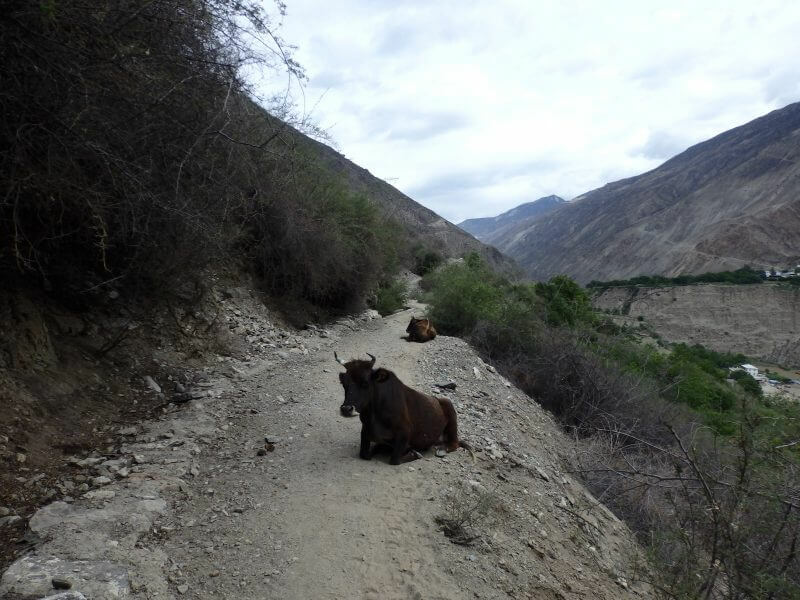 Fortunately, there wasn’t any other traffic on the road, possible because we were abit late to start on the trail too. 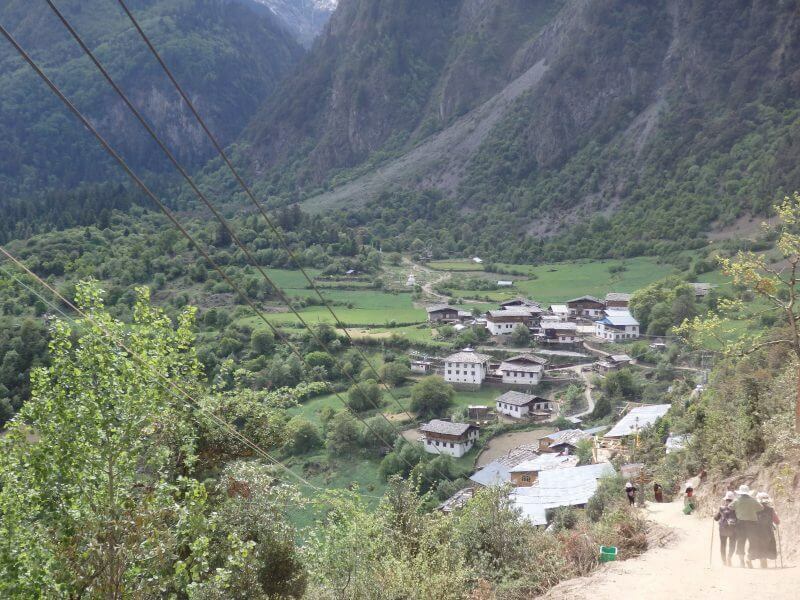 Down the valley from Feilasi to Xidang, start of the trail into Yubeng. 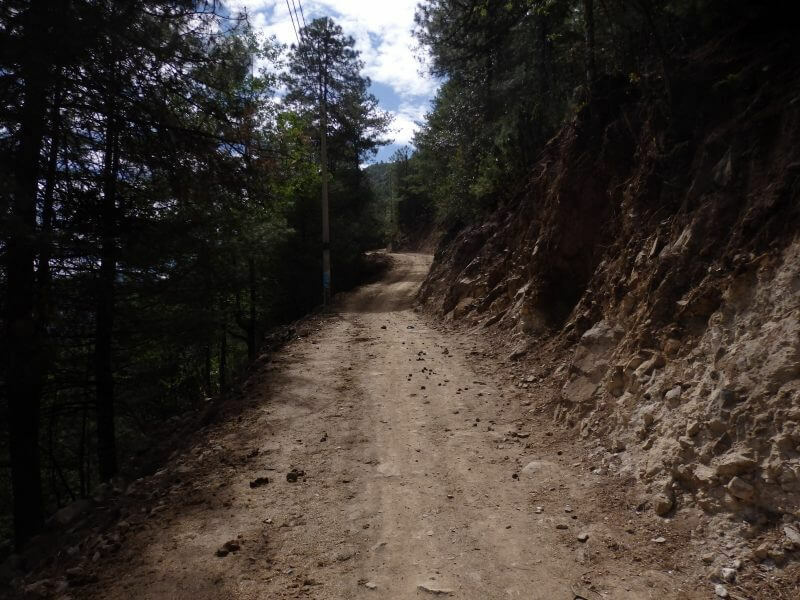 At the lower parts of the road, the paved road disappeared, and all that remained for the car to traverse on was a rock strewn, pothole ridden dirt track, possibly due to rock fall from the steep mountain slopes towering above the road. 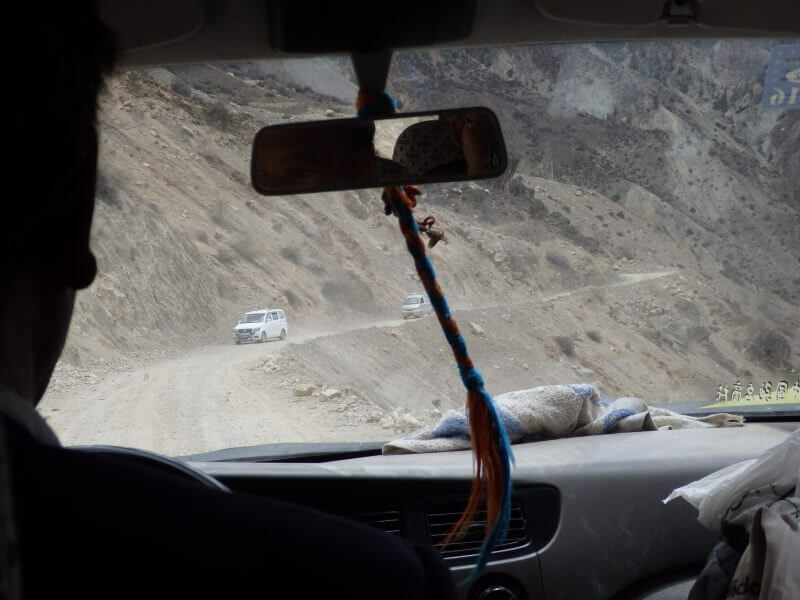 The driver slowed the car to a crawl as he navigated around the potholes, small rocks, and huge boulders, while keeping away from the steep drop on the other side of the road. 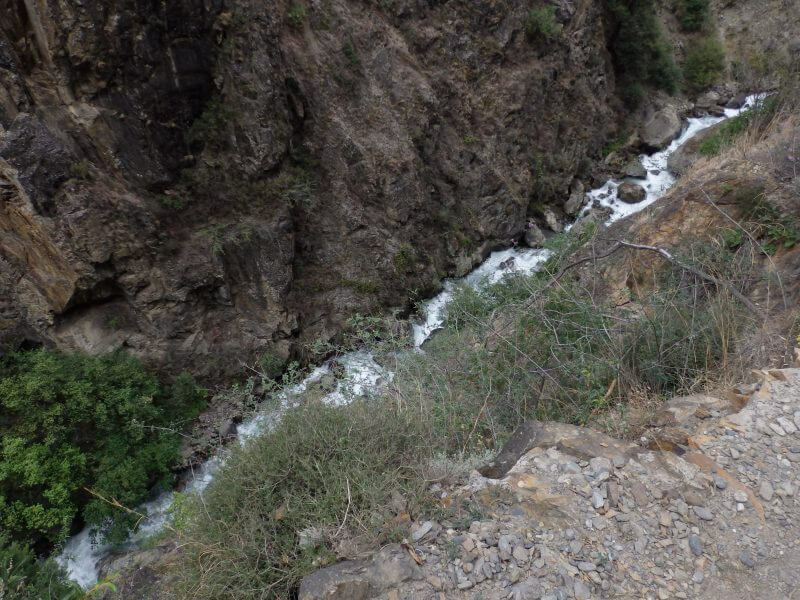 The ride was really bumpy, especially at the bottom of the gorge, where there wasn’t any proper road. 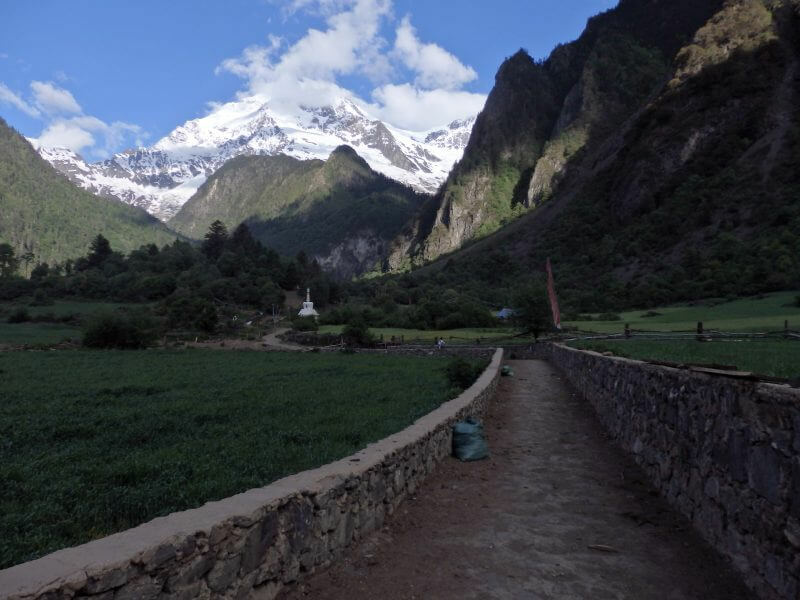 We made it (alive, fortunately) to Xidang, and began our slow hike shortly after. 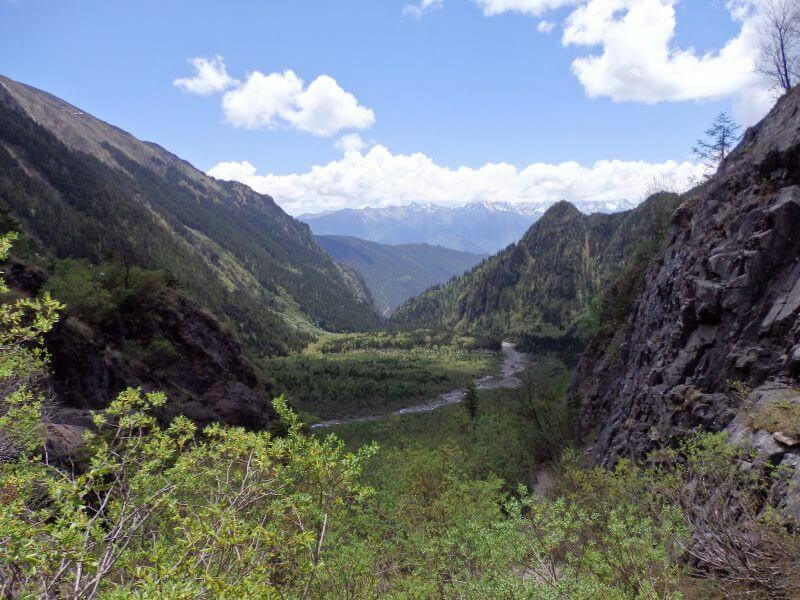 From Xidang (2,645m), it was a 1.1km ascent over a distance of 6.1km before a 500m descent over 3.3km to Upper Yubeng (and a further 170m descent across 1.6km to Lower Yubeng). 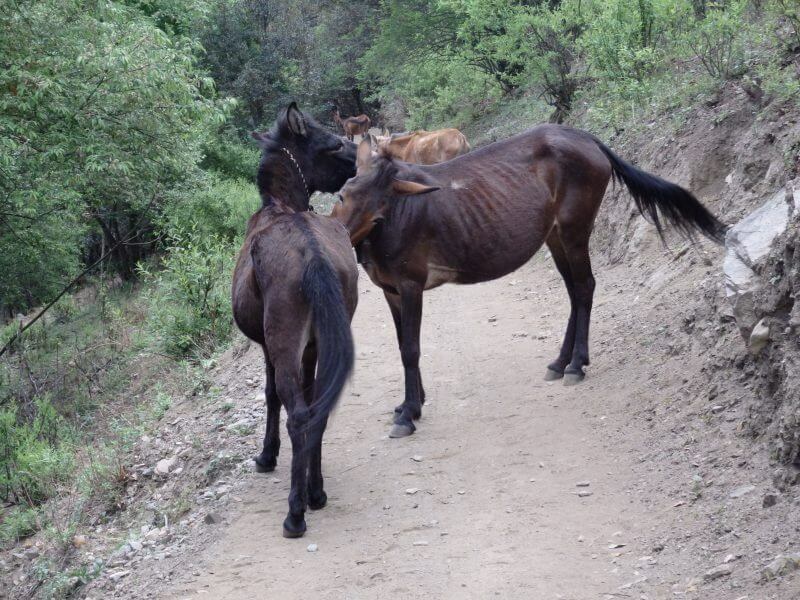 For those intimidated by the hike, donkeys are available for hire throughout the route. 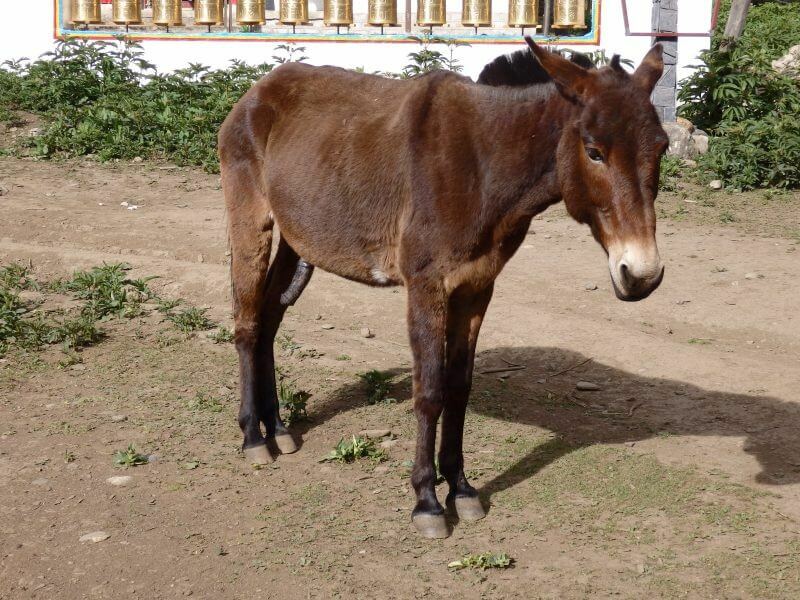 Donkeys available for hire. Didn’t ask for prices, but I reckon they wouldn’t come cheap. 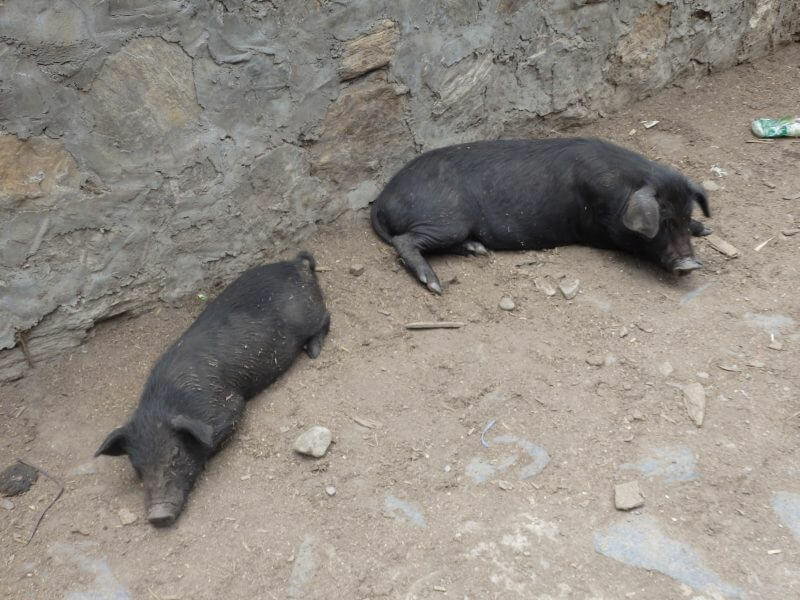 Yubeng village and its surroundings can only be reached by foot or donkey from Xidang or Ninong village, which also explains why food and beverages are at a premium from here on. Openings in the foliage provide excellent views (and much needed distraction from the fatigue). 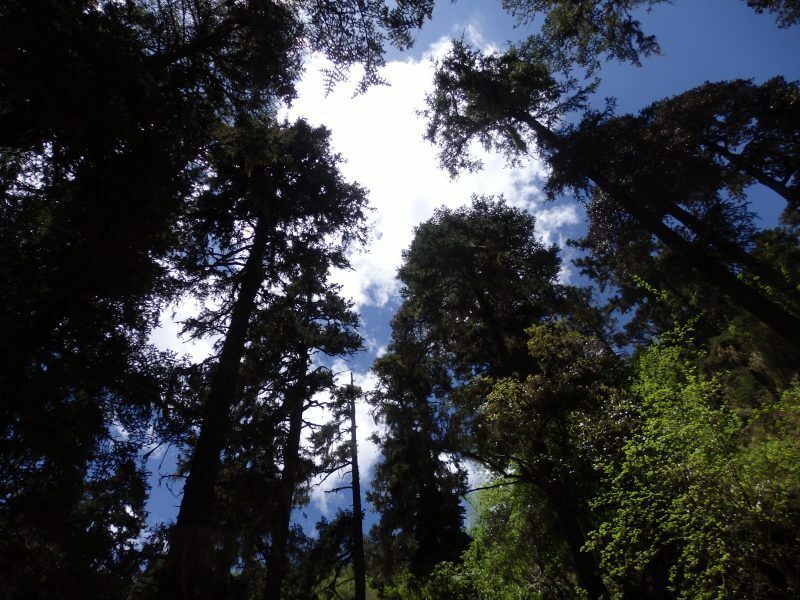 Tall trees along the tall order. 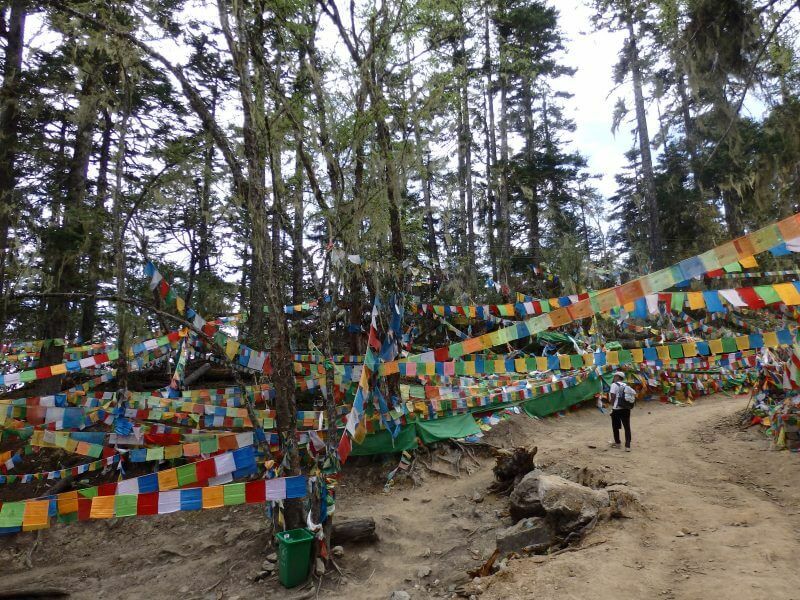 After a couple of rest stops along the way (priced up food and drinks available), we arrived at this maze of prayer flags. Pressed on and soon the path cleared. Snow leopards and brown bears have been spotted in the area before, but I’m glad that this was the closest to anything wild we spotted. 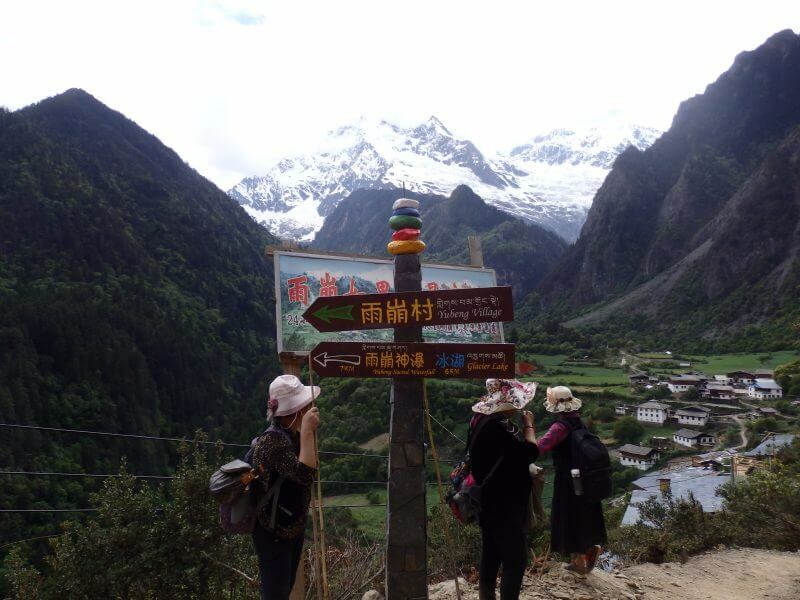 At Nanzheng Col, highest point of the trail (3,729m). The (almost) top of the world feeling. 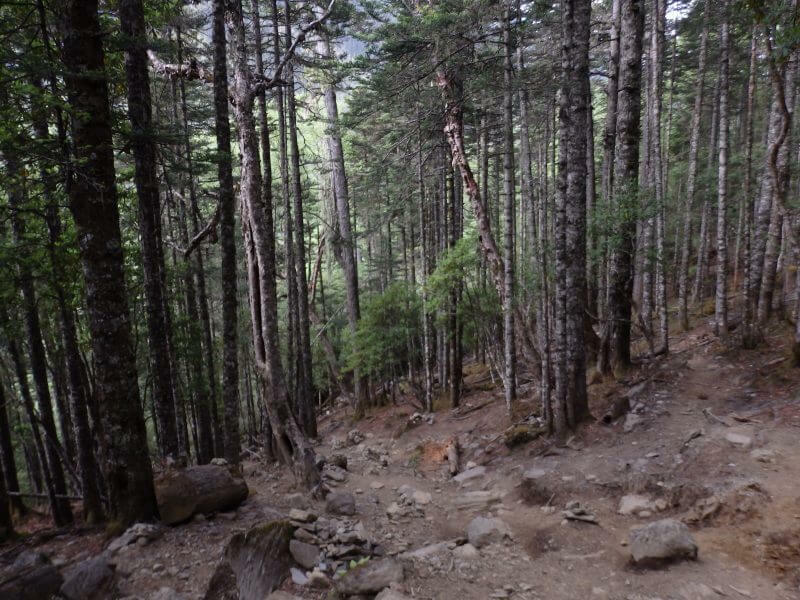 Not long after passing Nanzheng Col, the descent to Upper Yubeng. Another turning point a fork stuck in the road. 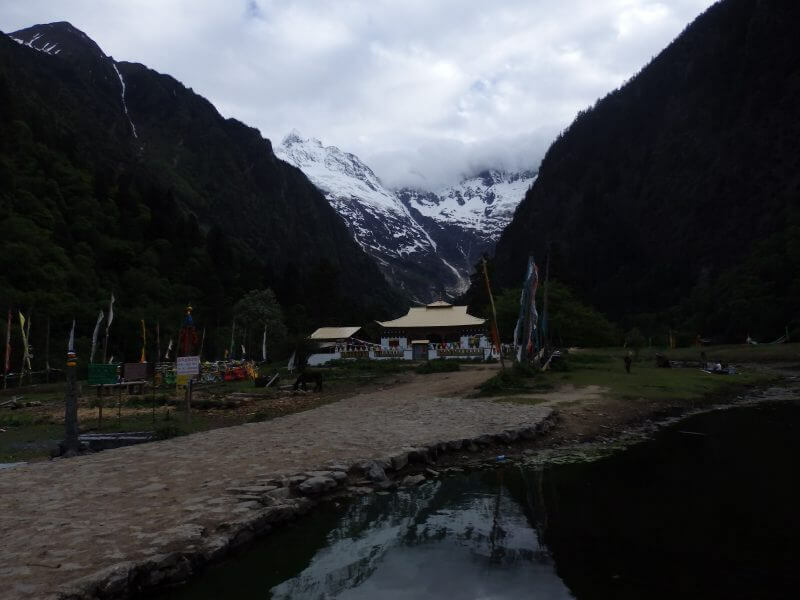 Picturesque village nestled amongst sacred grounds. 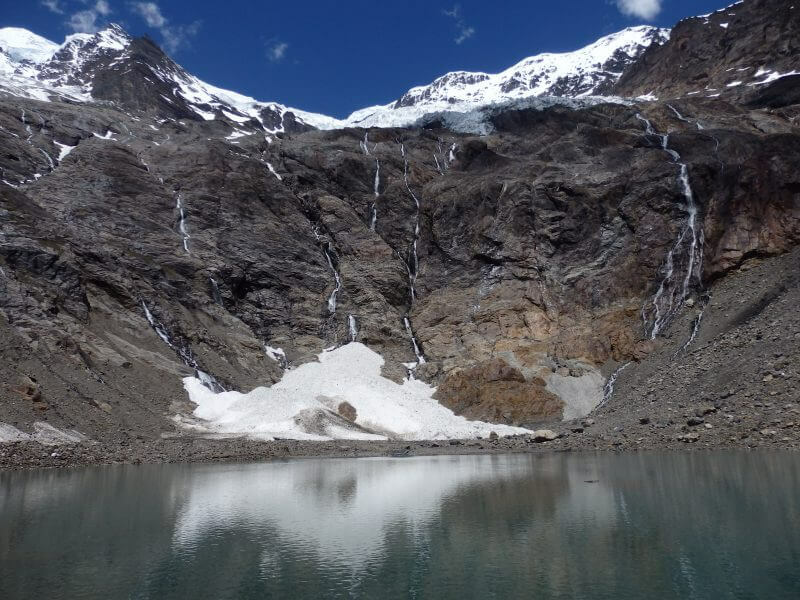 It would make sense to stay for a night at Upper Yubeng, visit the Glacier Lake the following day, before heading down to stay at Lower Yubeng, from which the Sacred Waterfall is easily accessible. 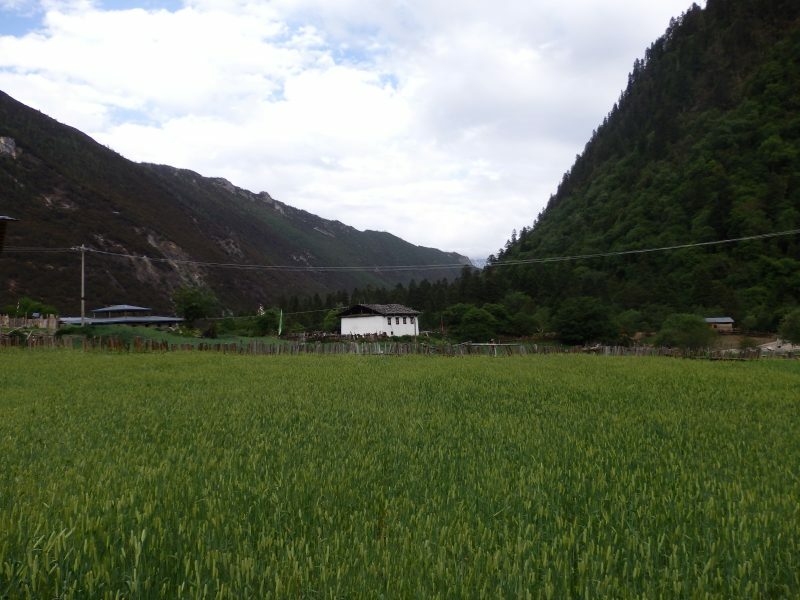 But due to some mixups with the accommodation, we ended up heading to Lower Yubeng to seek accommodation for the night. 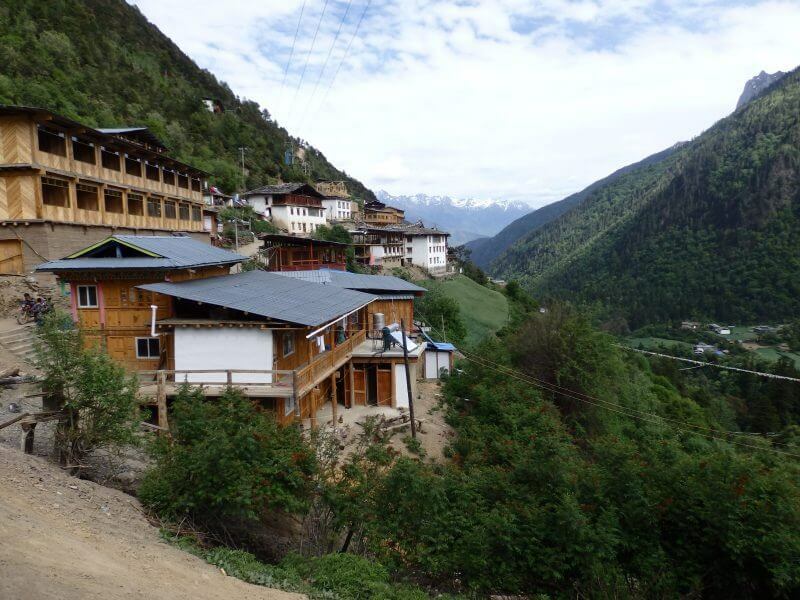 We had called in and booked a night at one of the inns at Upper Yubeng, but upon arriving, found the place to be shut. The person whom I called was still contactable, and I think she mixed up the dates, as there was no staff around. 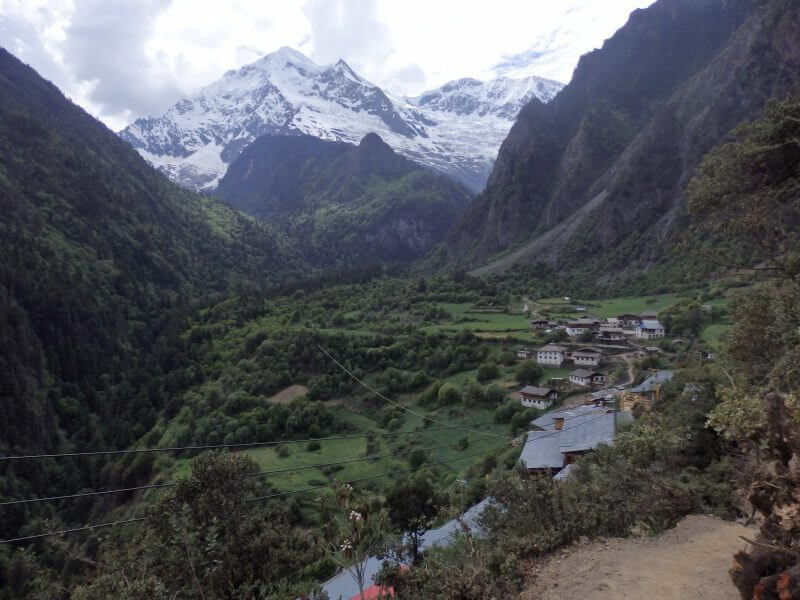 So we went to Lower Yubeng village, where another traveller I met earlier had been the day before, and hopefully we’d be able to meet him. 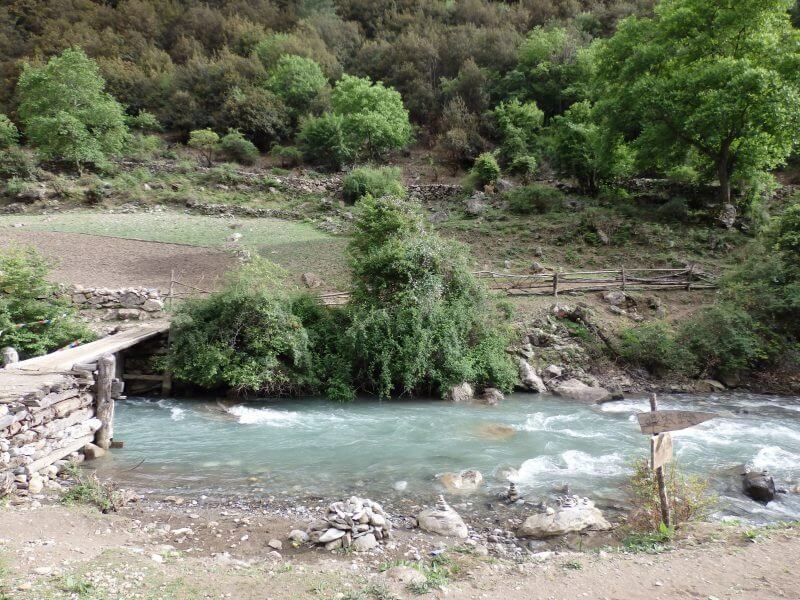 He had left by then (there wasn’t much reception in the mountains), and we were exhausted, so we checked into the guesthouse he had stayed in and gladly called it a day. Decided to spend the night at the last hostel at Lower Yubeng, closest to the exit to Ninong. Pretty comfortable beds, and working flushes. Had issues with the water though, it’s either freezing cold or boiling hot, but definitely better situation than no flush. This was the view from the hostel entrance. Despite the confusion over accommodation the previous night, we had a good sleep, and were blessed with great weather the next morning, another sunrise treat, this time deep within the mountains. Opened the dorm door the next morning and saw this. 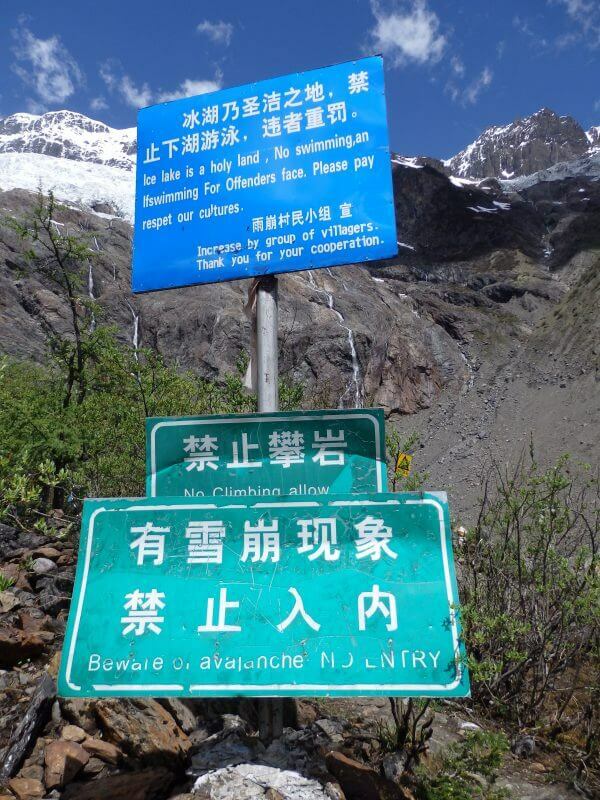 Not knowing how long the trip to the Glacier Lake would take, we started the day early, just to be safe. Caged trees. Can you sense their desperation to escape? 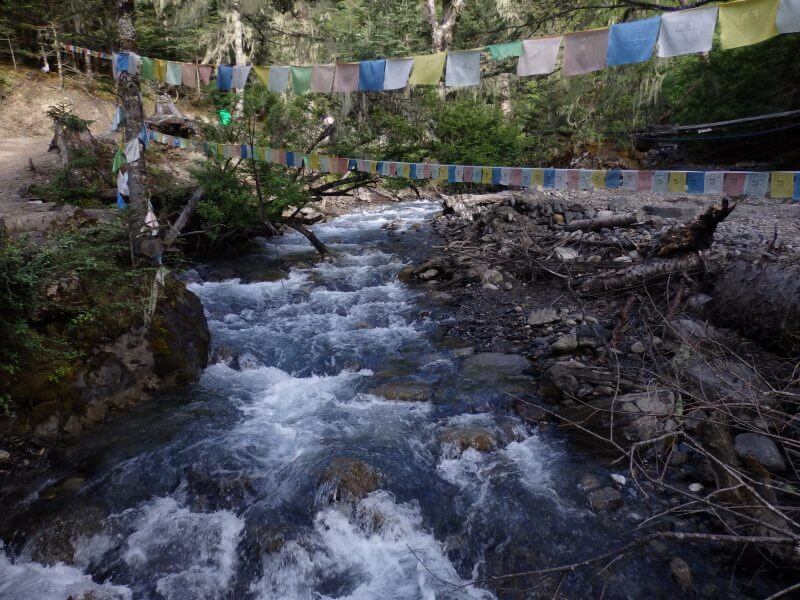 Little stream that originated from the Glacier Lake. The hike wasn’t too dramatic or exciting, but the constantly evolving landscape through the mountains was enough to keep me sufficiently intrigued. The green bins might seem like an eyesore at first but after some time they became the only sign that we were on the right track. 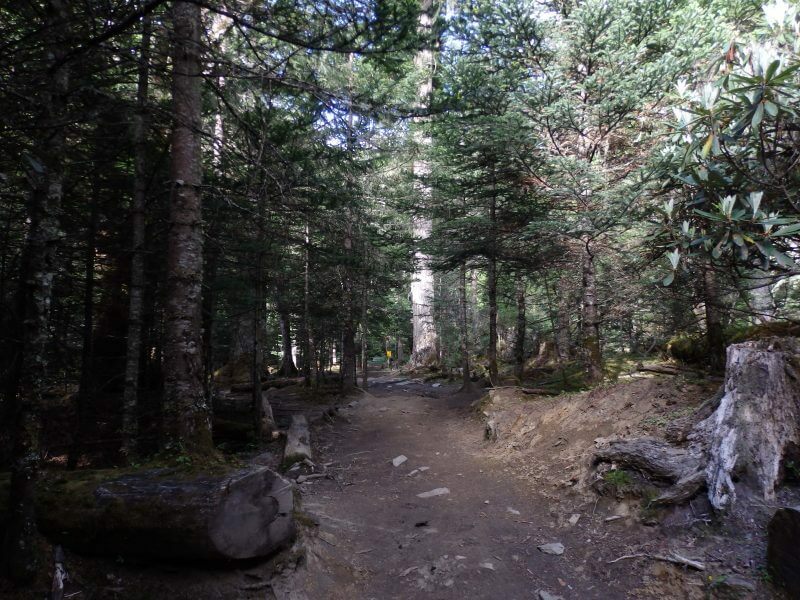 Signage and demarcated paths were few and far between. As were any other humans. Had to get on all fours at some points. Wouldn’t be nice to slip. Thankful for the great weather. 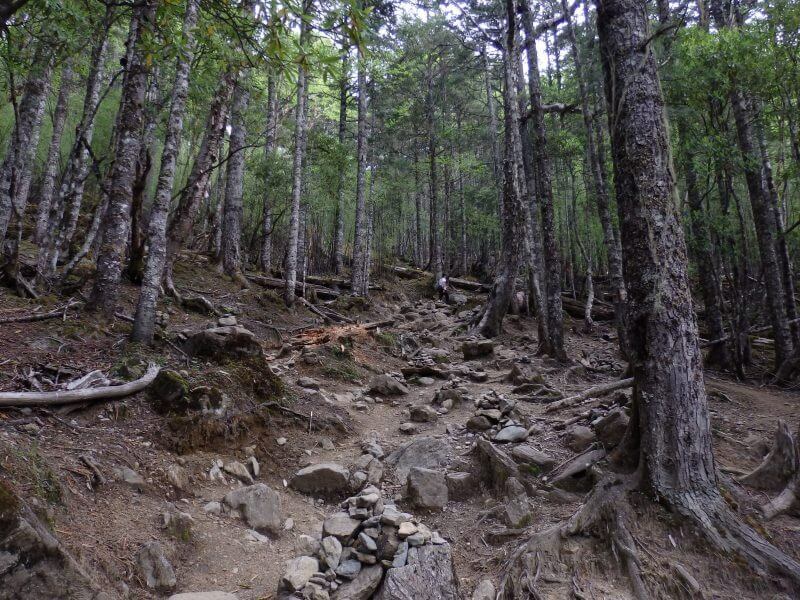 At the top of the steep ascent. No streaming at the stream. Phone connections mostly dead by now. 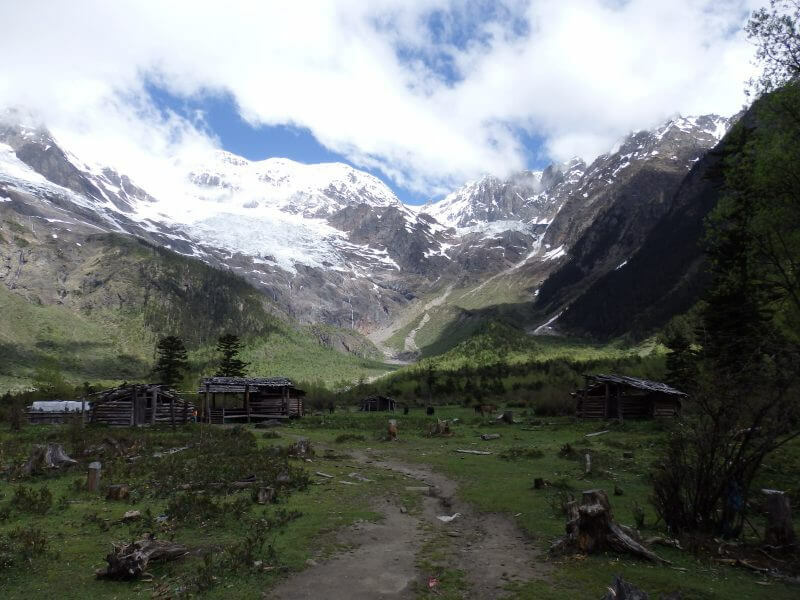 After a few hours the woods cleared and we arrived at Xiaonong Farm/ Kawagarbo (Kawagebo) Base Camp (3,608m), where ill fated expeditions to Kawagebo’s summit began. Probably the place where anyone last saw those who never returned. 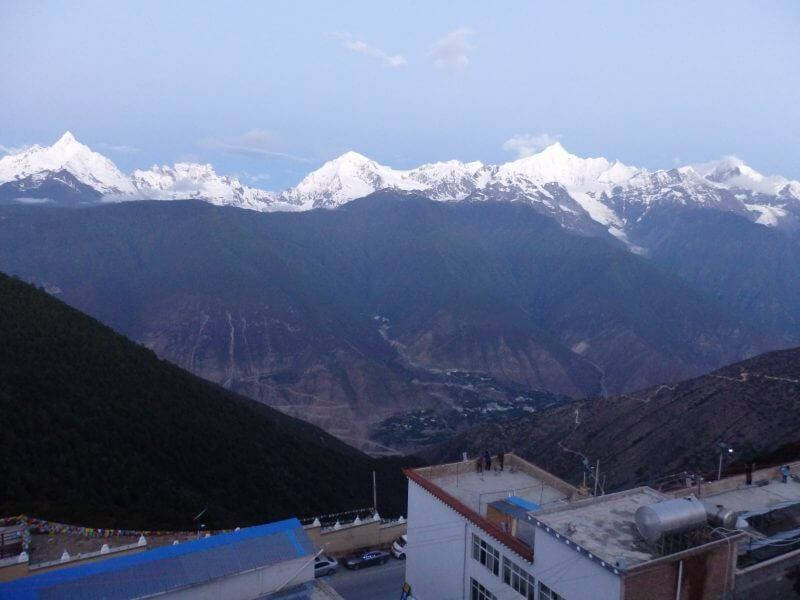 Xiaonong Farm/ Kawagarbo Base Camp (3,608m). Mostly deserted when we arrived. I think accommodation is available here in summer. 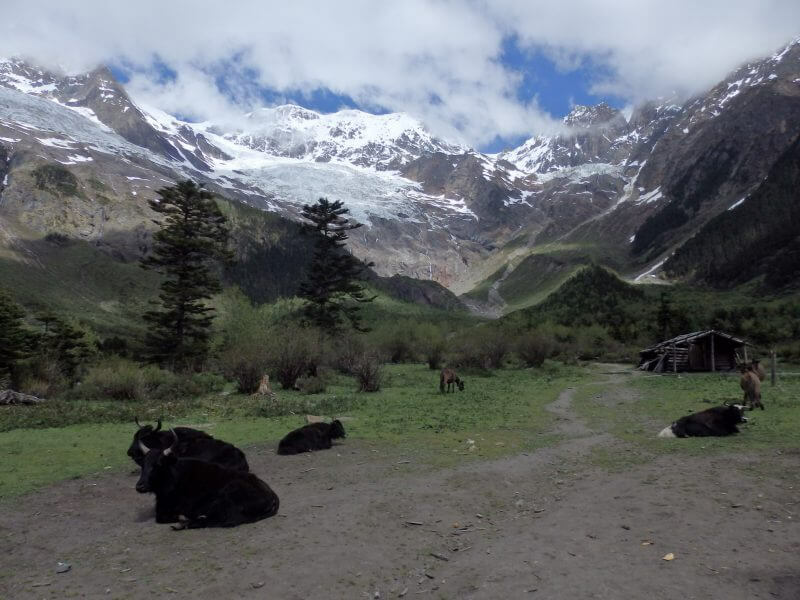 These yaks don’t give a fak. 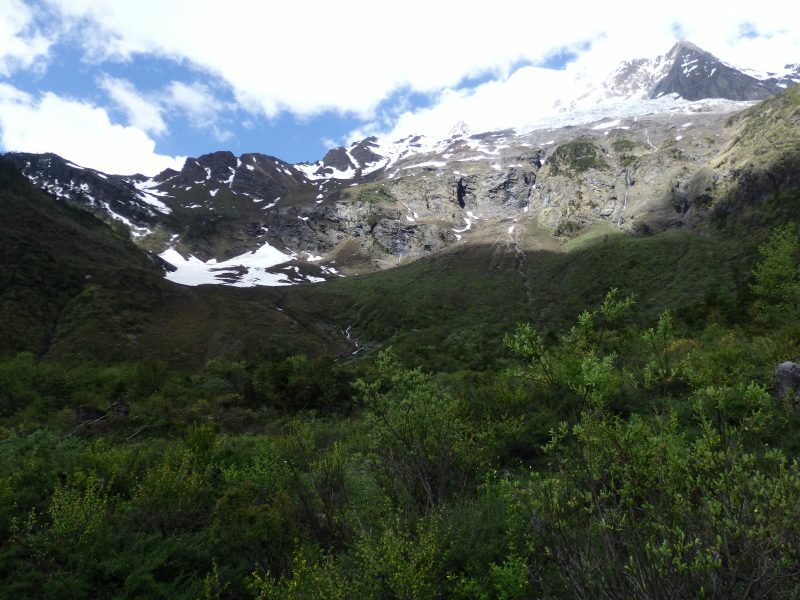 Beyond the farm/ base camp, the short and final stretch to the Glacier Lake. I could stay here all day if it never rained and if there was Wifi. 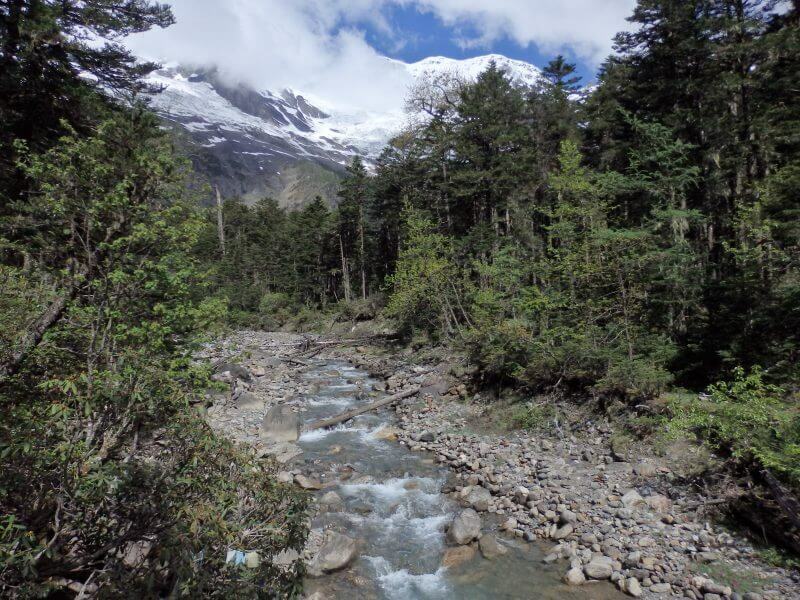 Pristine streams and snow-capped peaks. Getting in touch with nature. 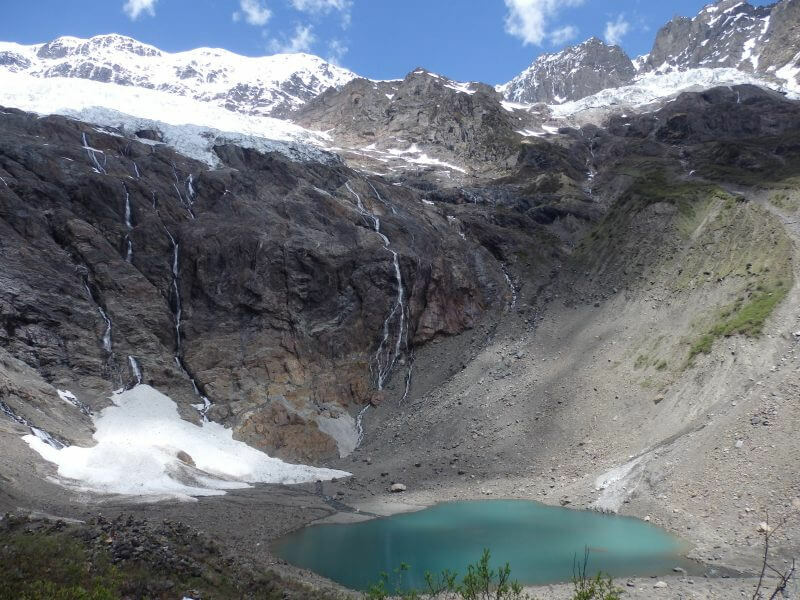 Finally at the “Glacier Lake”! In quotes because 1, there was no ice, and 2, there was no huge body of water. 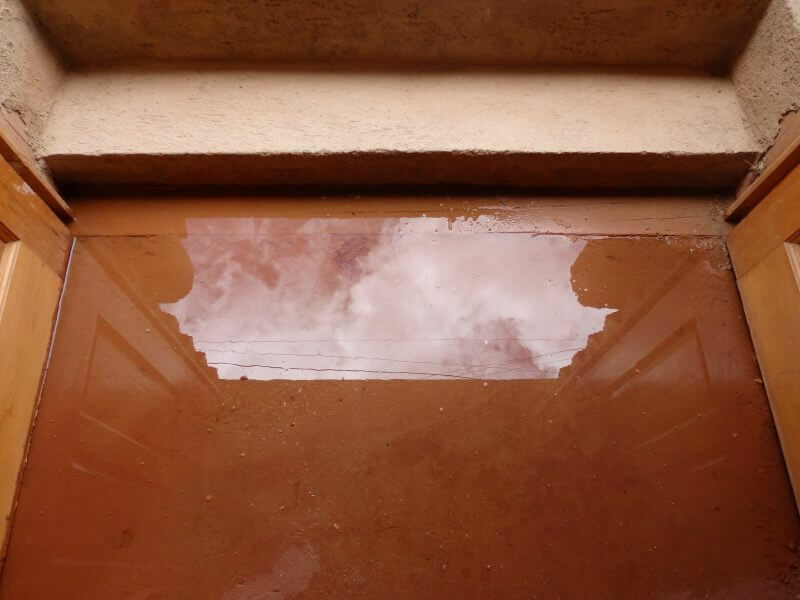 As consolation, though, at least it was a pretty puddle. 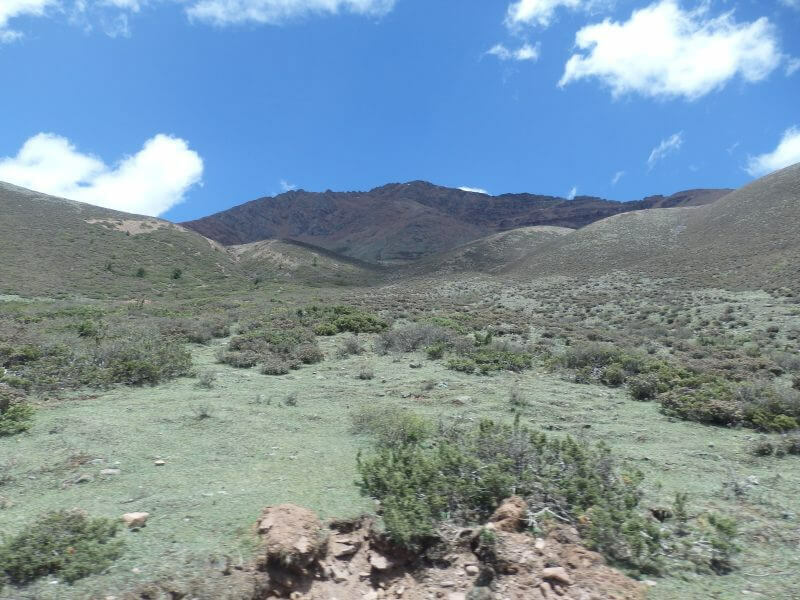 Also, at 3,864m, it’s the highest point of our 4 day hike. Tempting to shout across the lake for the echo, but nope, not after that avalanche warning. The pretty puddle, from a little back. 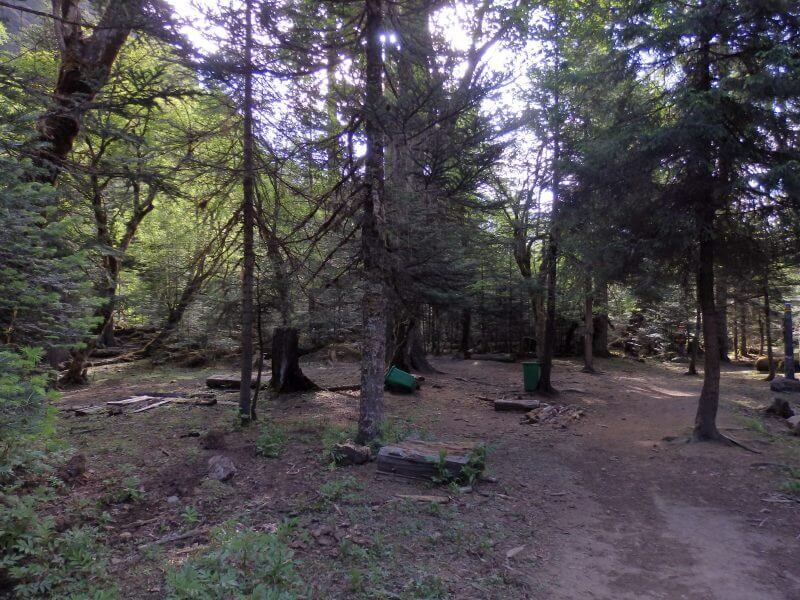 We rested for awhile here, surrounded by nature and good weather, had some snacks (kept our trash, of course), and enjoyed the amazing scenery, almost untouched yet still relatively accessible. The water felt really refreshing to touch, so I stole a few sips at the outflow of the “lake”. 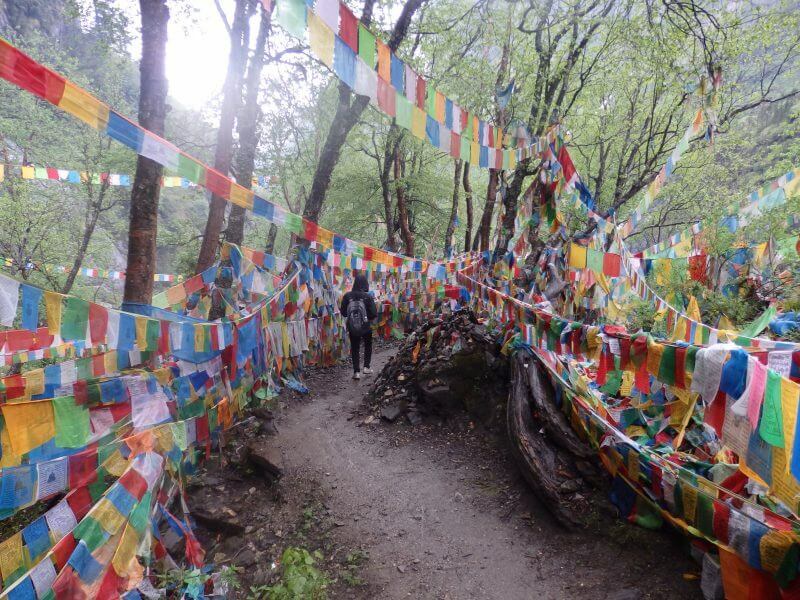 Feeling all refreshed and recharged, we started our hike back to Yubeng village. Turning back towards the village. Not sure which mountain range those peaks belonged to, but it was breathtakingly set against the never ending fields. 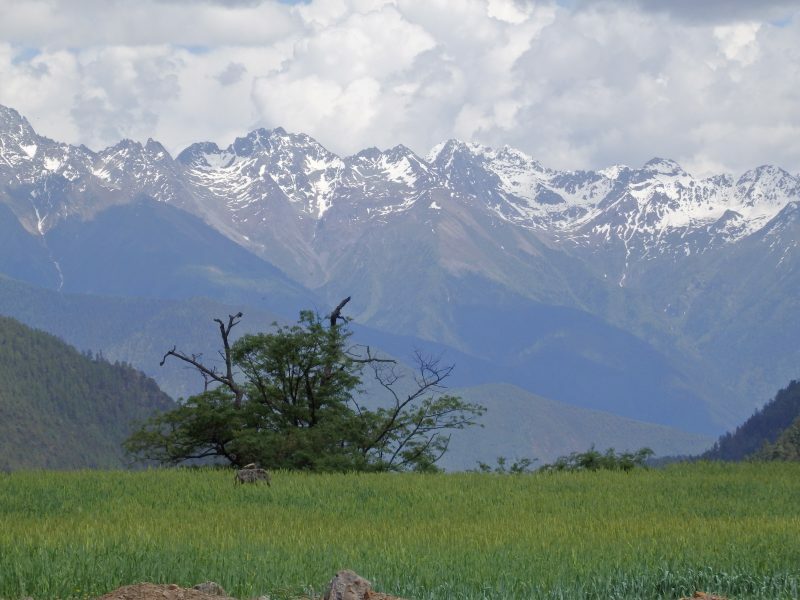 Wide open fields with stunning snow-capped peaks as the backdrop. 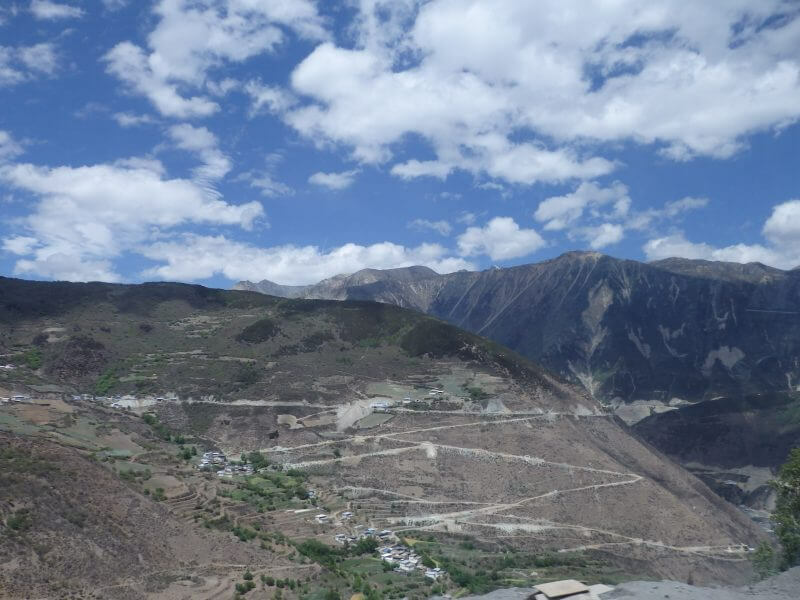 We arrived back at Upper Yubeng village early in the afternoon and had lunch at one of the stalls perched precariously along the ravine separating Upper and Lower Yubeng villages. 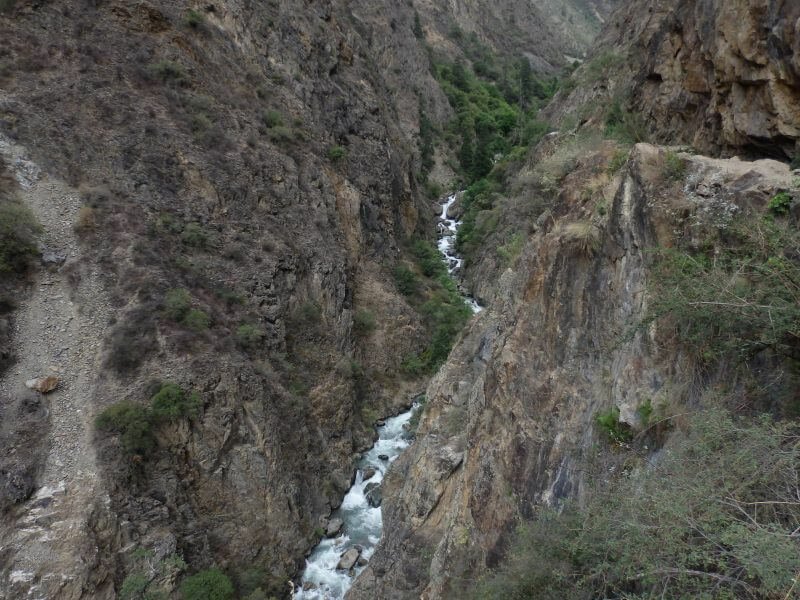 The ravine between Lower and Upper Yubeng. Donkeys bringing tourists up. Getting around the villages can be tiring without some fitness. After lunch we went back to the hostel and had a good afternoon nap, waking up around dinner. The range of food options weren’t spectacular but we tried to make it as sinful as it can be. Nothing beats sinful food after a great hike. 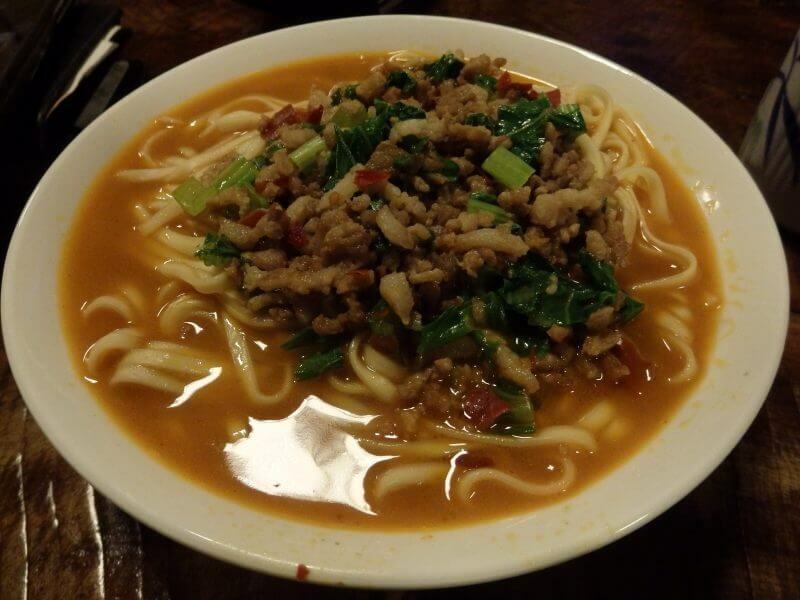 Food at Yubeng is similar to that in the cities, just a little pricer due to the donkey joy ride these noodles took to arrive on our plates (or bowls). During dinner the guesthouse restaurant was playing a documentary on the infamous Kawagebo/ Kawagarbo attempt in 1991 that ended in the death of the entire team of 17 following an avalanche. Guests at the restaurant seem entranced by the video, but it felt a little too close for comfort. There wasn’t much else to do as it was pitch dark outside, so we called it a day (or night). And that was day 2. The sun rose early and so did we, to begin our final hike into the mountains. Today was our final full day here as we were to head back to Shangrila the next day. 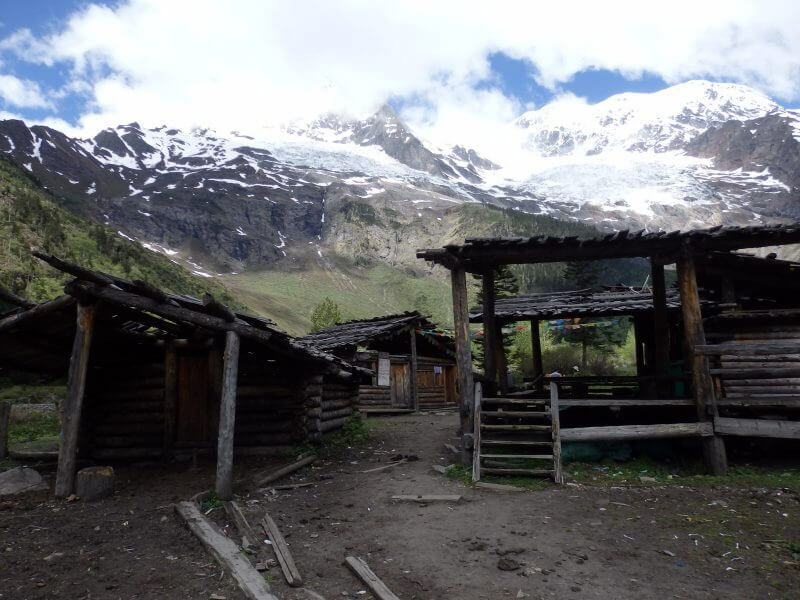 It was always nice walking around/ through the village, surrounded my mountains, forests, and farm animals. 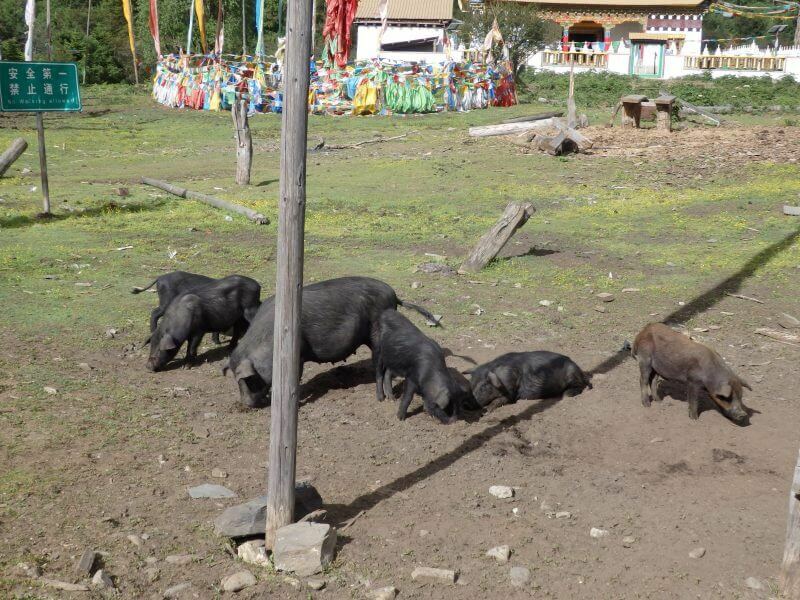 Rather than being caged, animals were mostly free to roam the villages. I wonder if they ever get lost. Took me awhile to remember why I took this picture. Then I could not unsee. Had more explicit ones but I didn’t want my blog to get flagged. 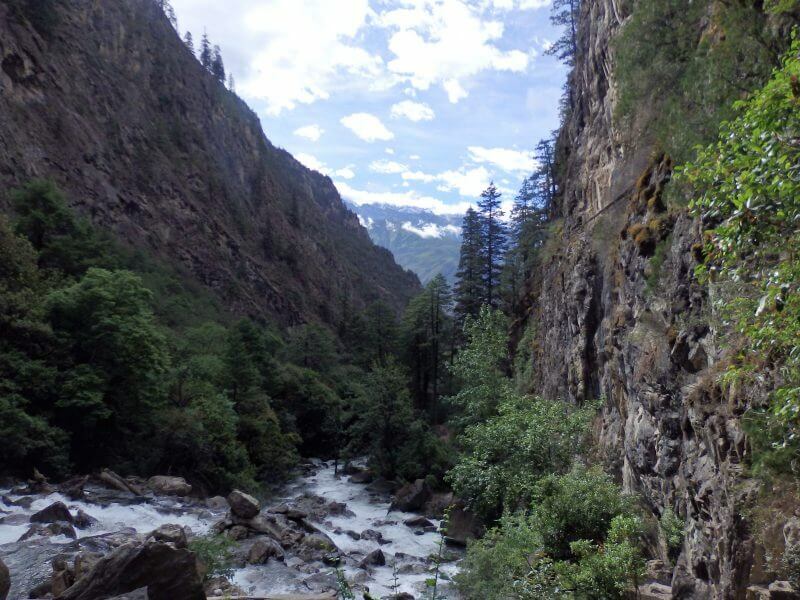 Soon we were at the edge of Lower Yubeng village, to begin our hike to the Sacred Waterfalls. 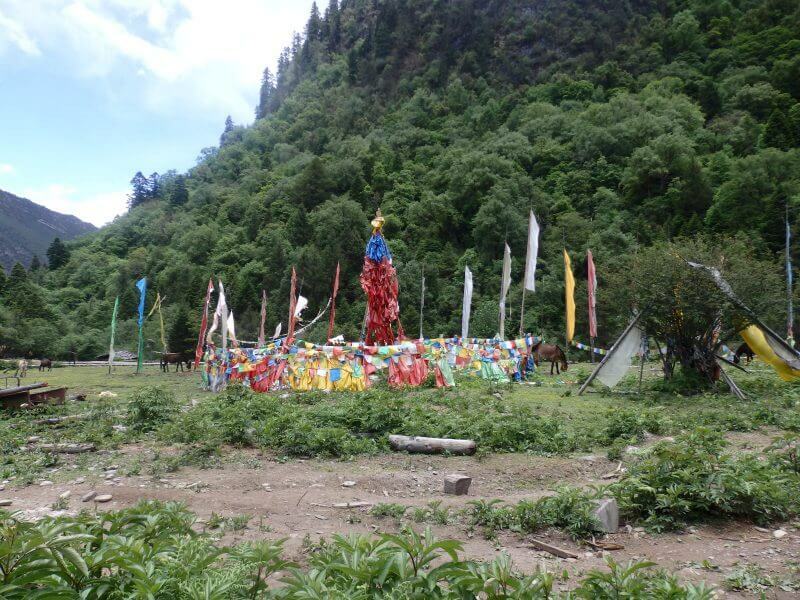 There was some sort of TIbetan ritual ground just on the outskirts of the village. 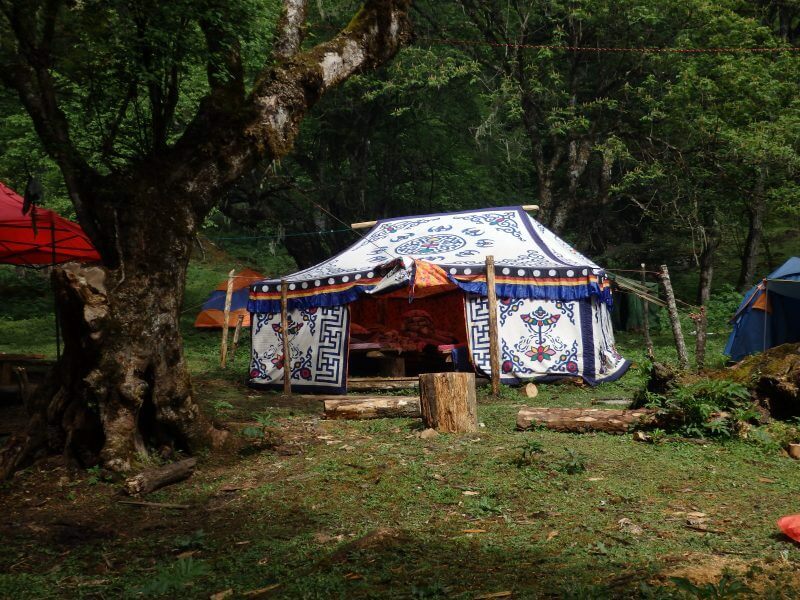 Along the way, there were tents set up as accommodation for more adventurous travellers. Not too sure about their conditions, but they appear to be decently furnished. 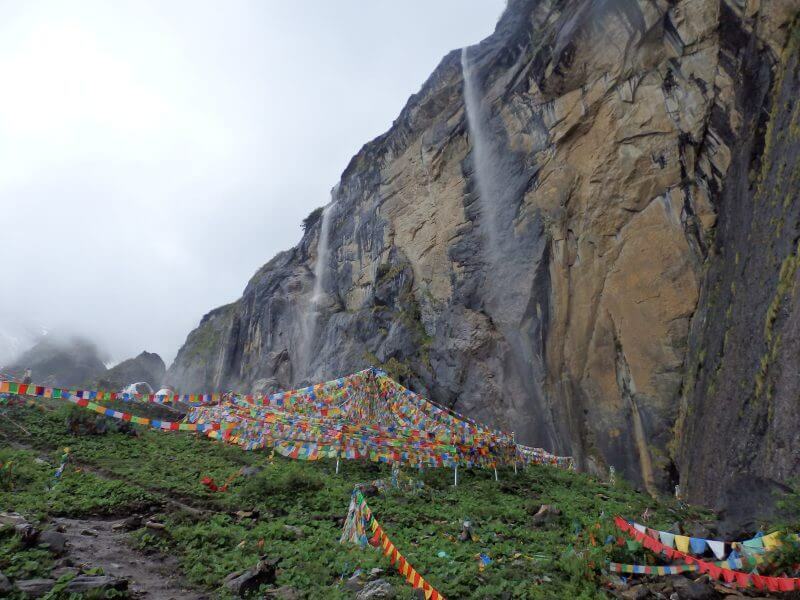 Tent accommodation available between Lower Yubeng and the Sacred Waterfall, with decent looking beds inside. After two days of great weather, the sun took a backseat on our third day. 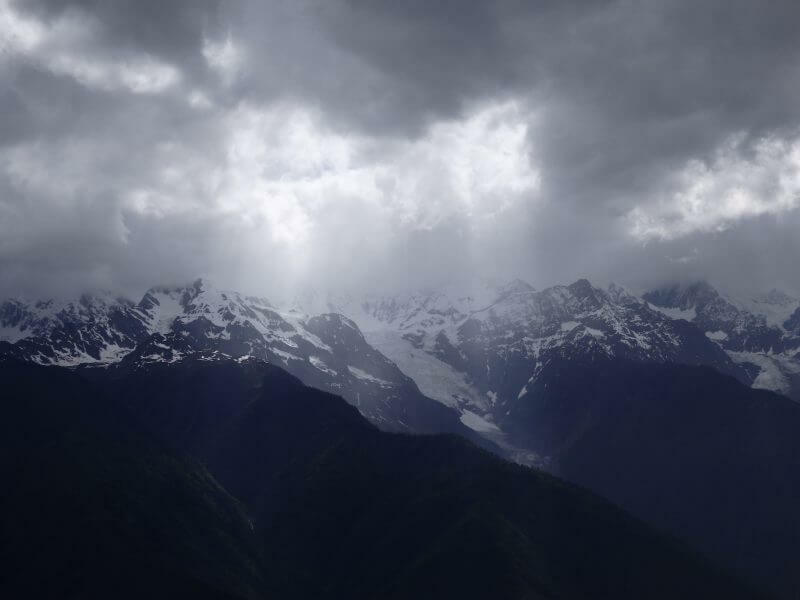 The snow-capped peaks were nowhere to be seen as they were covered in clouds and fog, and it started to drizzle a little. Still ok weather to hike in, and it gave the mountains and scenery a different feel and view. 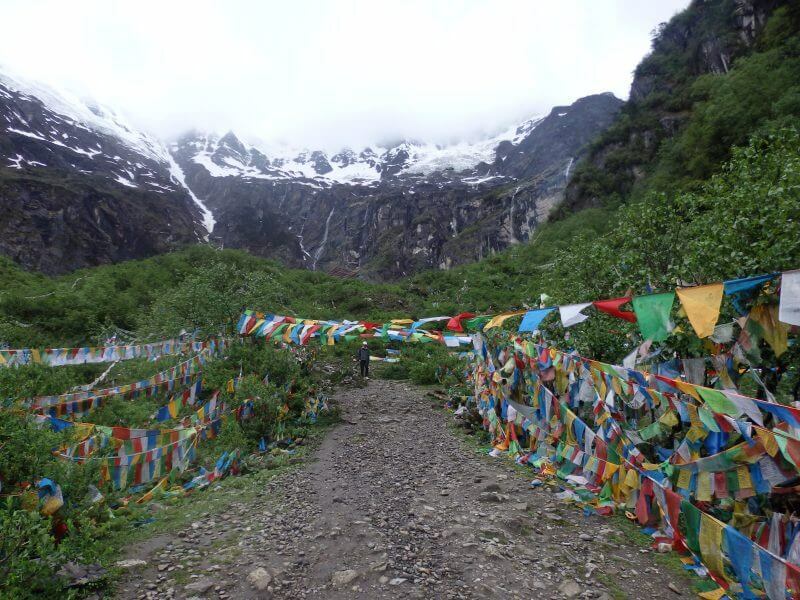 Towards the Sacred Waterfall (5.4km from Lower Yubeng). More farm animals and tents. 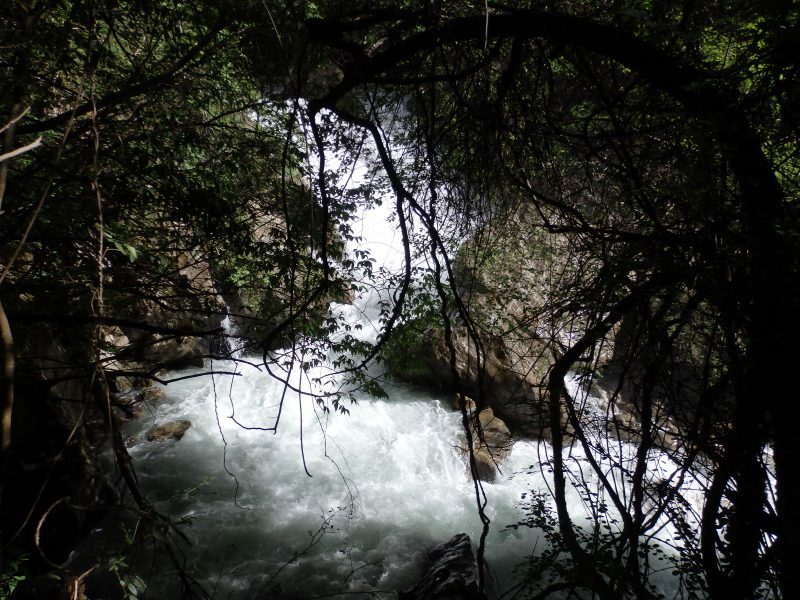 The rain grew heavier as we approached the Sacred Waterfalls, and we took refuge at a shelter just before the final ascent to the waterfalls. 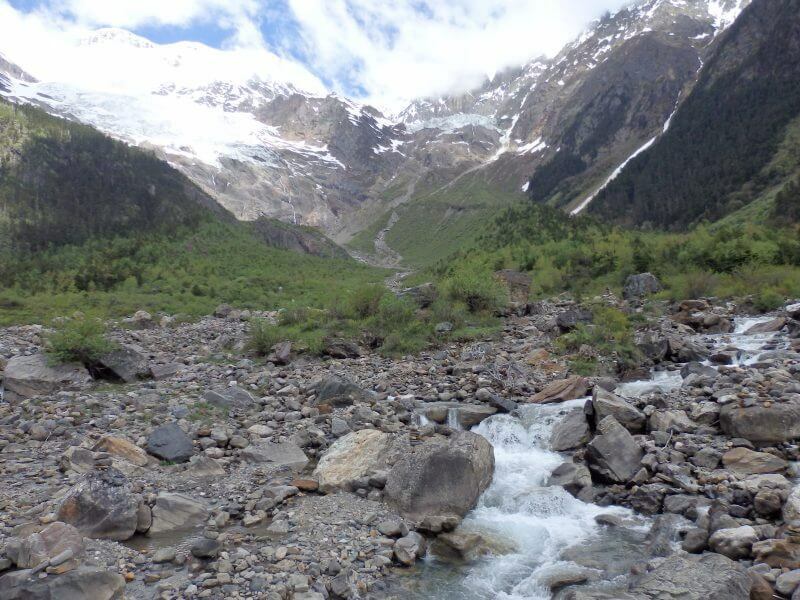 The route was considerably more crowded than the trail we took the the Glacier Lake the previous day. Some Chinese men couldn’t wait for the rain to stop, so they stripped (to keep their clothes dry) and made a dash for the top. 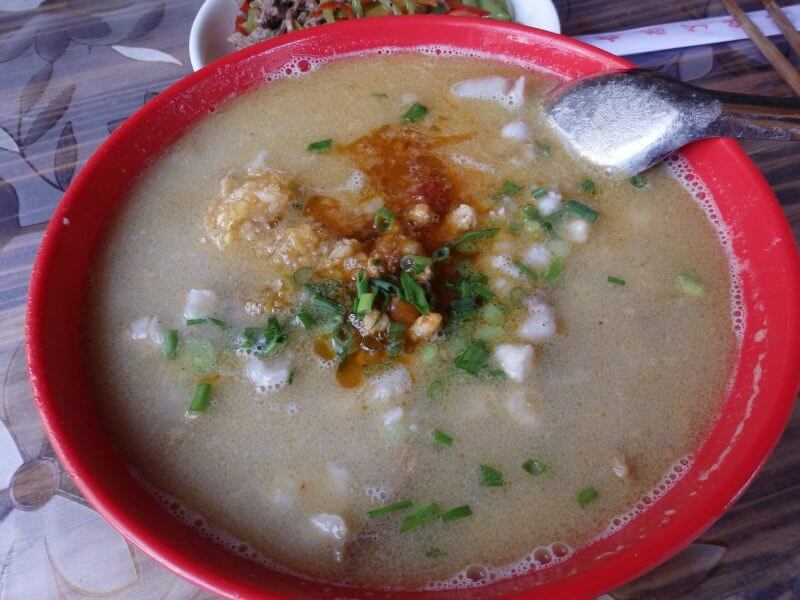 Not really recommended with the temperatures and chilly wind. Anyway, the rain lightened a little not long after and we continued our hike. 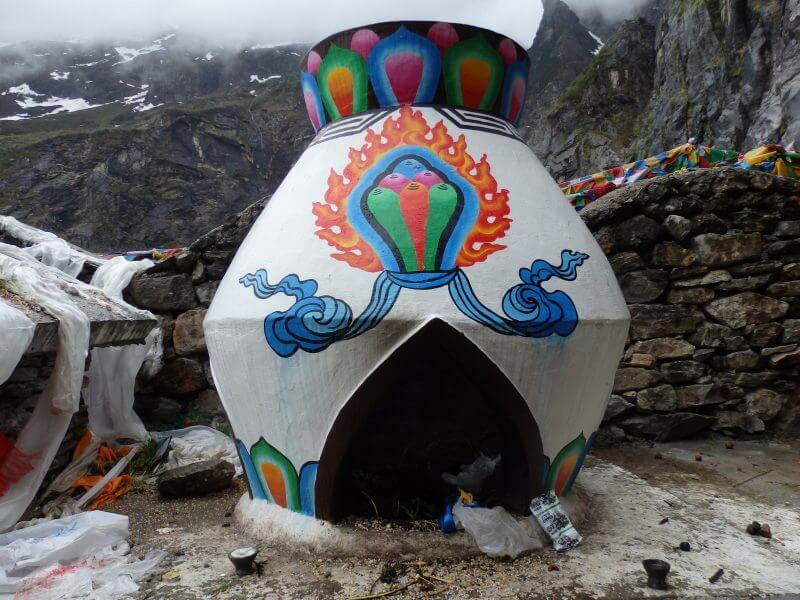 Another sort of Incense burner. 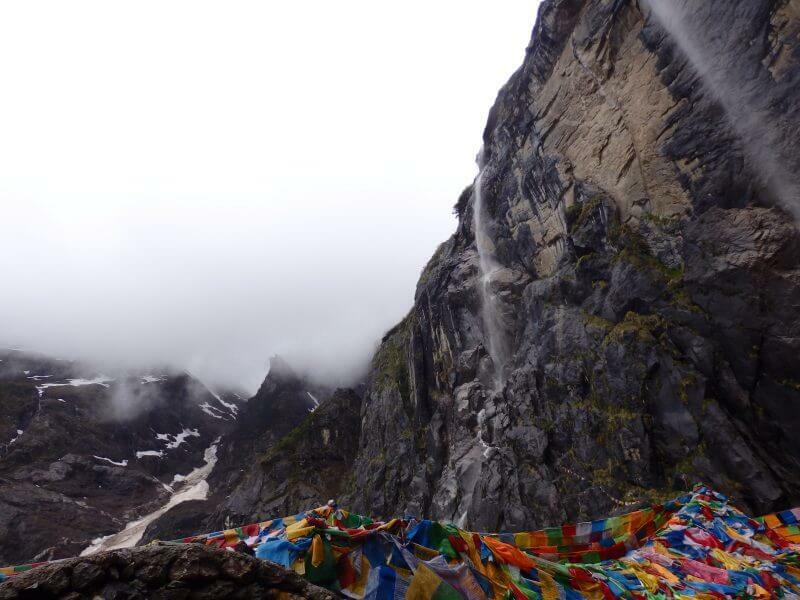 The Sacred Waterfall (3,657m at the bottom). Another one I could not unsee after zooming in. It was freezing cold after the rain and wind yet Chinese men were stripping to their undies and taking a shower at the falls. Must have been inspired by Chairman Mao’s swim. Here’s one in red undies. 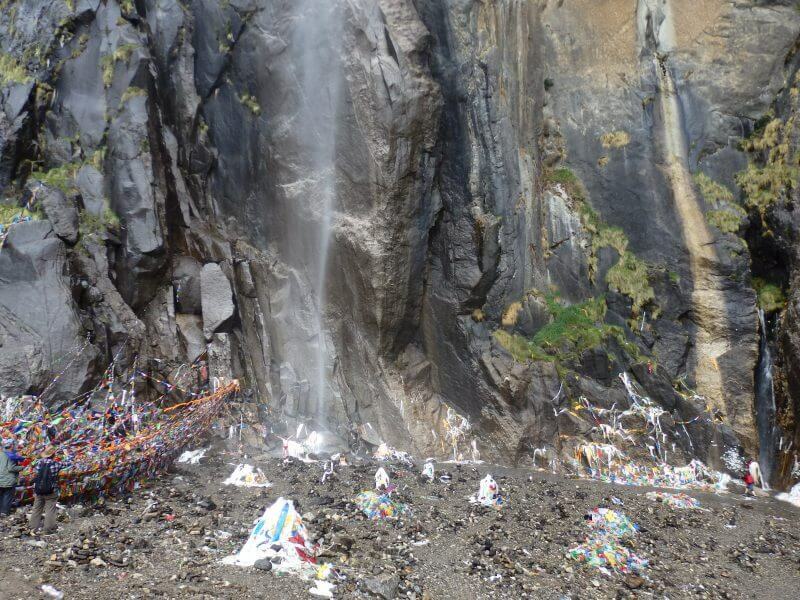 The Sacred Waterfall, slightly further away. 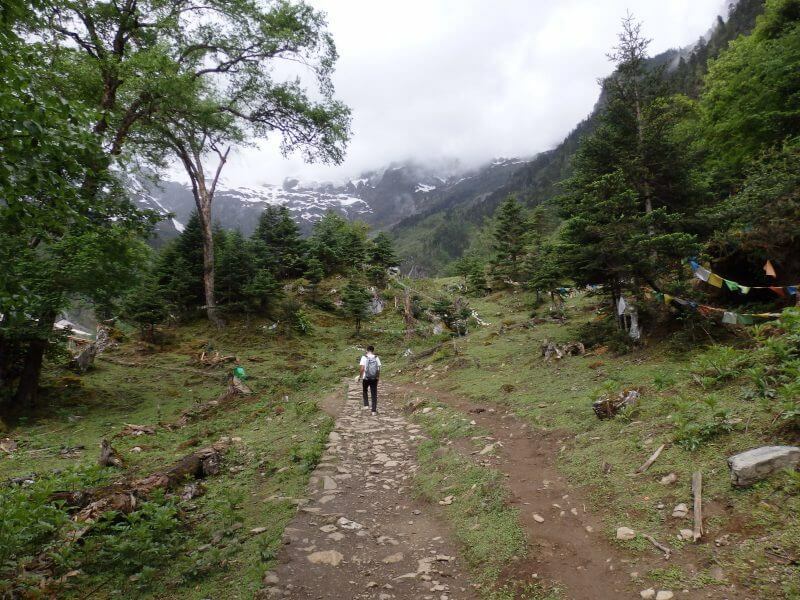 The weather still wasn’t too appealing, so we didn’t hang around too long, and started our trek back to Lower Yubeng village. Someone started a small fire beside a shelter just before the final stretch to the falls. (Smoke at middle left). 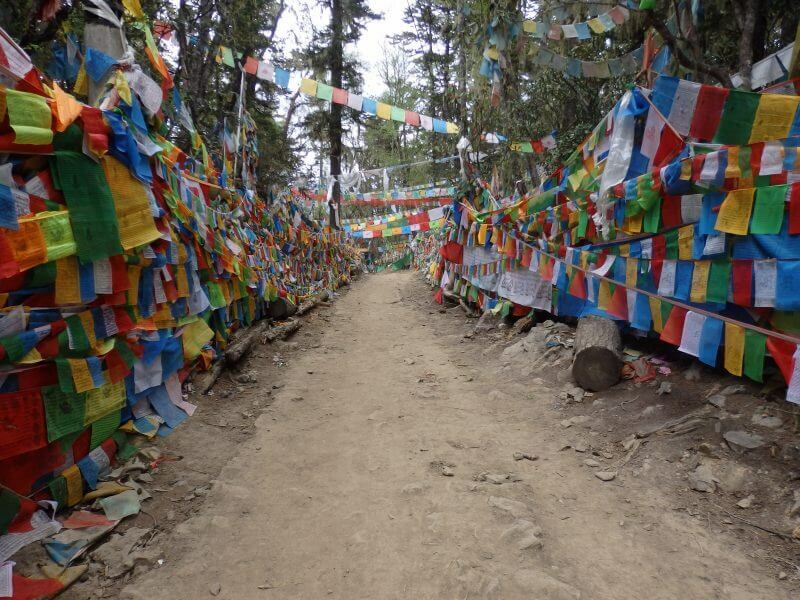 Prayer flags lining the path. Weather starting to clear up. Last look at the Sacred Waterfall. 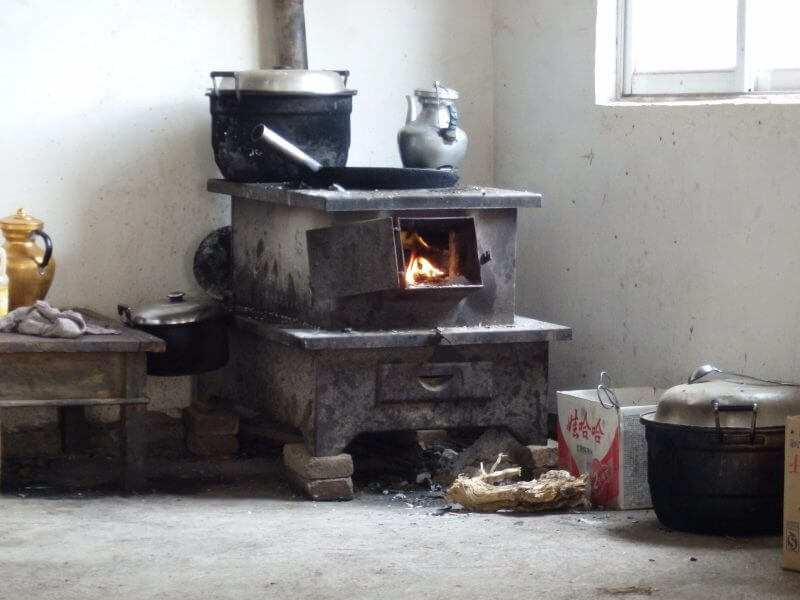 Warm food never felt better. And changing into warm clean clothes. And the following afternoon nap on the clean, warm, and dry bed. The hike probably took about half a day or so, and the rest of the day was spent lazing around, in between naps and snacks, reading the book I had with me, and listening to music. 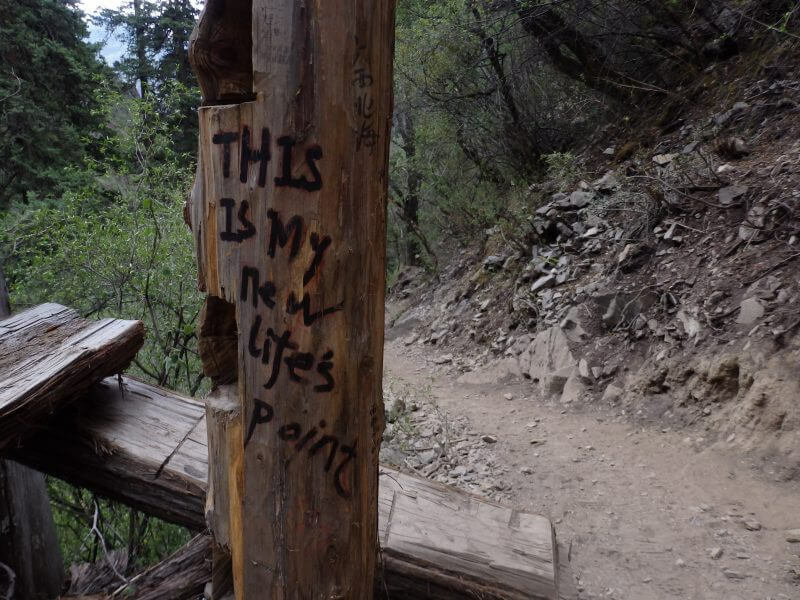 Ah, life in the cold windy mountains, with no Wi-Fi. 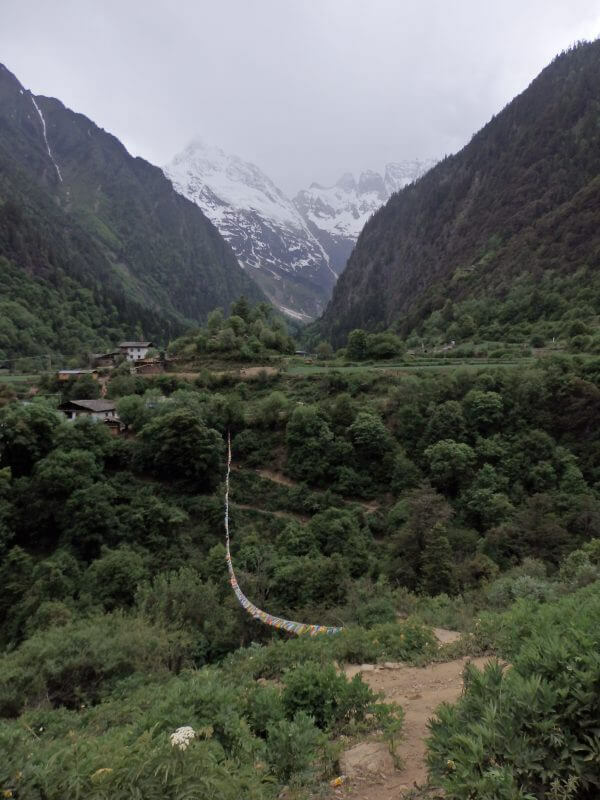 The last day in Yubeng was a little tighter, as we had to hike out to Ninong in time to catch the transport to Deqin, which in turn had to be in time for us to catch the bus back to Shangri-la. The last bus was early in the afternoon, so we had to get hustling. 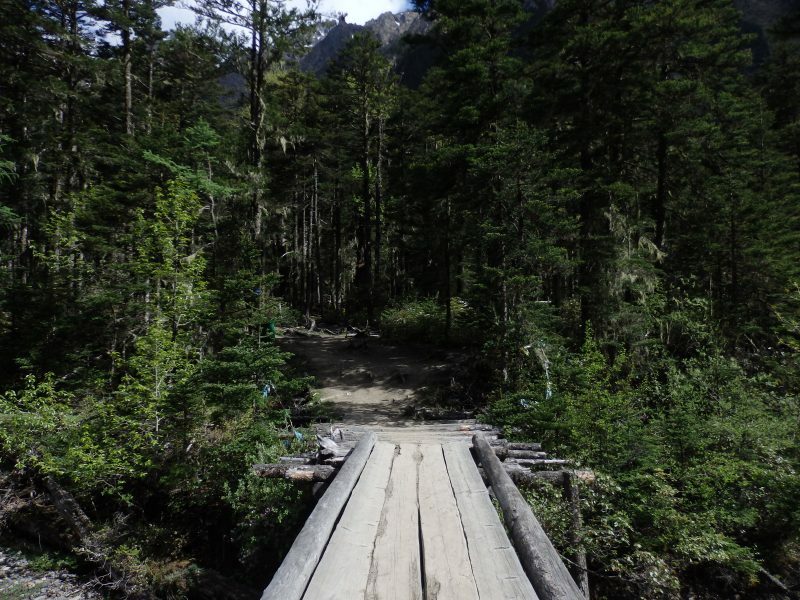 The trail to Ninong, like the one from Xidang, was narrow and impassable to vehicles. 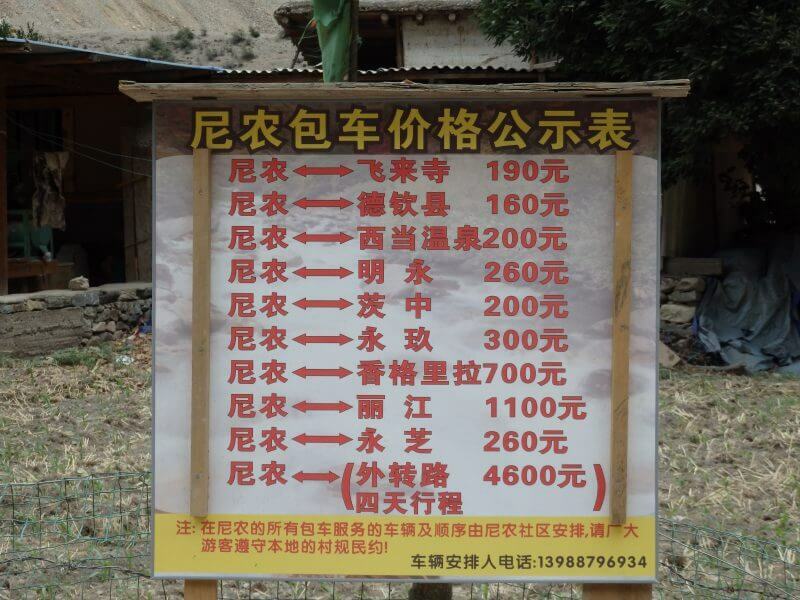 Although I’m quite sure I saw a motorbike in Yubeng. But back to the point, the path had to be shared with passing animals, or sometimes we’d just have to wait while they’re having their fun. Farms on the way out of Yubeng to Ninong. Took these in May 2015, but now looking at it, reminds me of The Good Dinosaur. These waters can take all your troubles away. 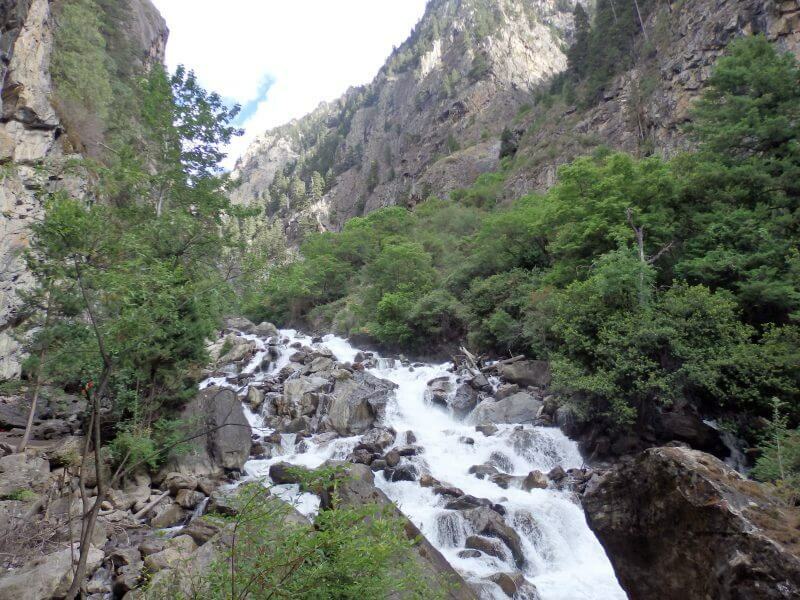 Now I know where all the Chinese calligraphy masters get their waterfall/ mountain inspirations from. Scenery between Yubeng and Ninong wasn’t as spectacular as the scenery between Xidang and Yubeng, but it was nonetheless interesting, and still very much precarious (or probably more). 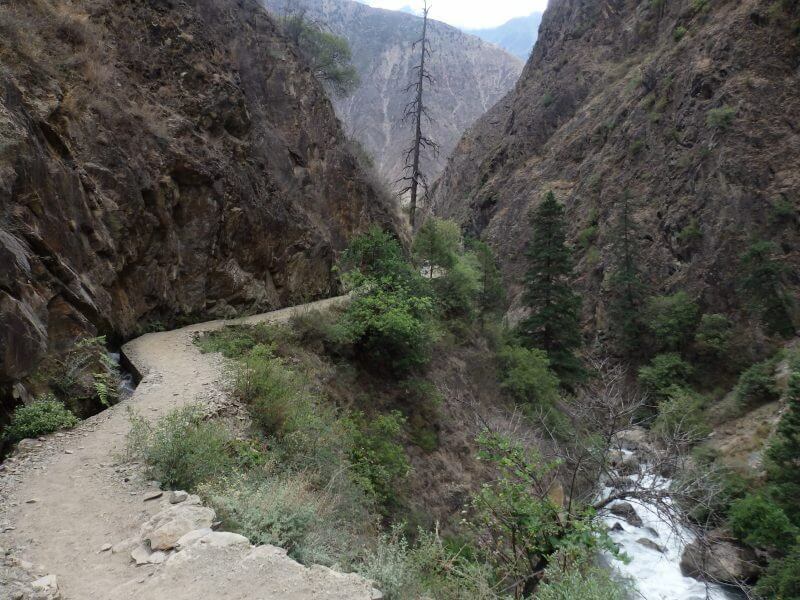 Narrow paths were flanked by steep mountain slopes on one side and the plunging ravine on the other side, which dropped lower and lower as the trail went on, till it was probably over a hundred meters below. Any rockfall/ tectonic activity/ a moment of carelessness would likely mean an unescapable death. The narrow, winding path out. The little ledge on the right, less than a metre wide, is where the walking path is. 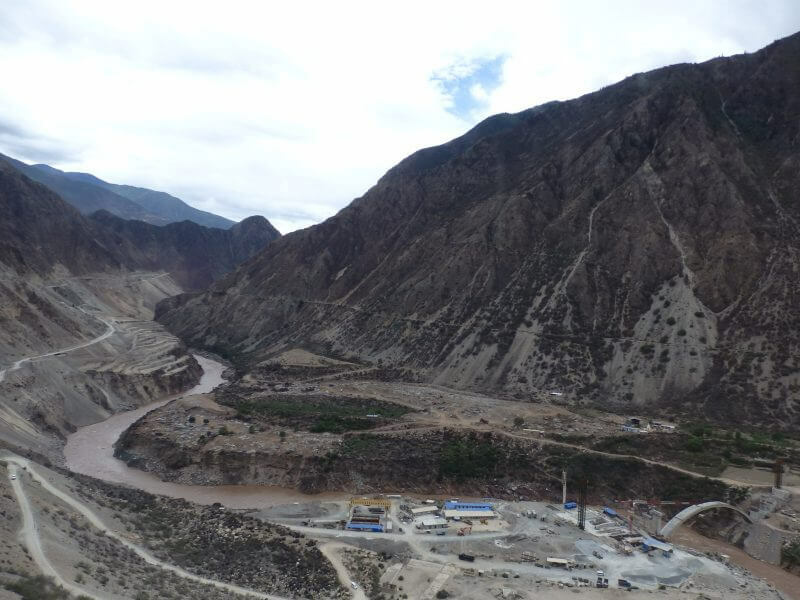 As we exited the mountains the vast Lancang river valley greeted us, the view a little destroyed by ongoing construction. Then again, without all the construction work building the highways, I would not have been able to get in in the first place. 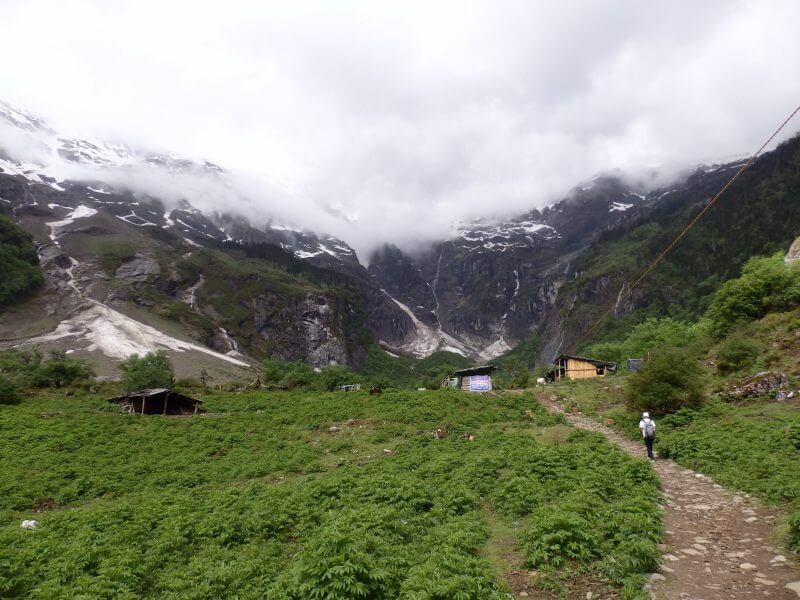 We kept walking until the trail ended, then realised we shouldn’t have gotten that far, as the entire village was deserted. Our joy at completing the 4 day hiking trip almost turned into desperation as we couldn’t find anyone to ask for directions from. Fortunately we found a kind old lady in the end who offered desperately need directions to the pickup point for transport to Deqin county. We also bought some much needed overpriced soft drinks from her, but we were glad to pay the premium. We overshot the trail a little and ended up at a deserted part of Ninong, was supposed to exit at the carpark where vans/4wd cars wait. 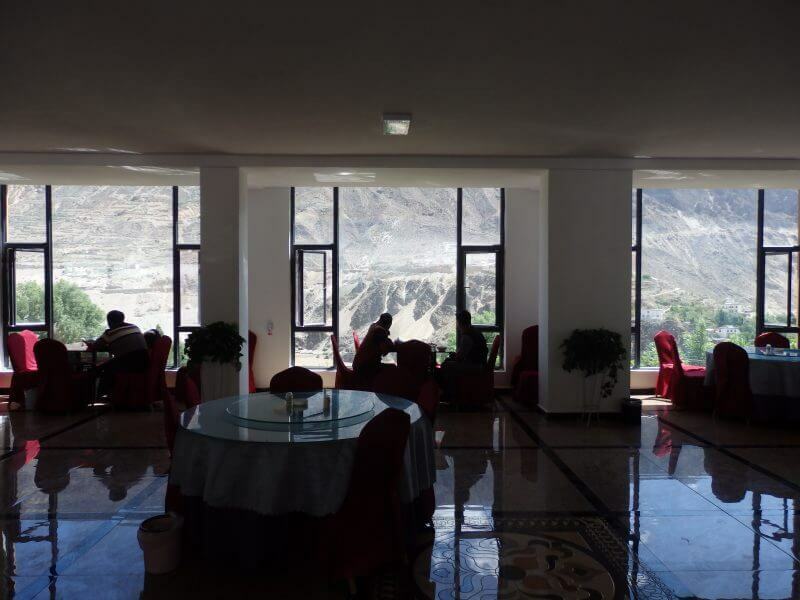 There weren’t other hikers out yet, so we decided to have lunch while waiting to see if we could share a vehicle with other hikers to Deqin county. Transport, similar to the one from Feilaisi to Xidang, was charged by per vehicle, on 4 wheel drives. Lunch while waiting for other hikers to share the transport with. Charges are similarly by vehicle. It seemed like a slow day for hiking, as we only managed to join up with one more guy heading out despite waiting for an hour or so. 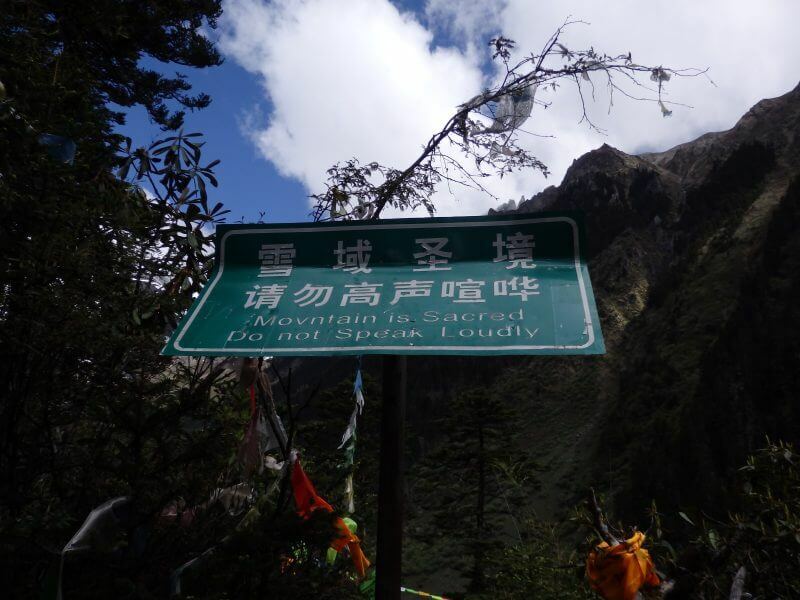 We had to leave by then, in order to catch the bus back to Shangri-la. 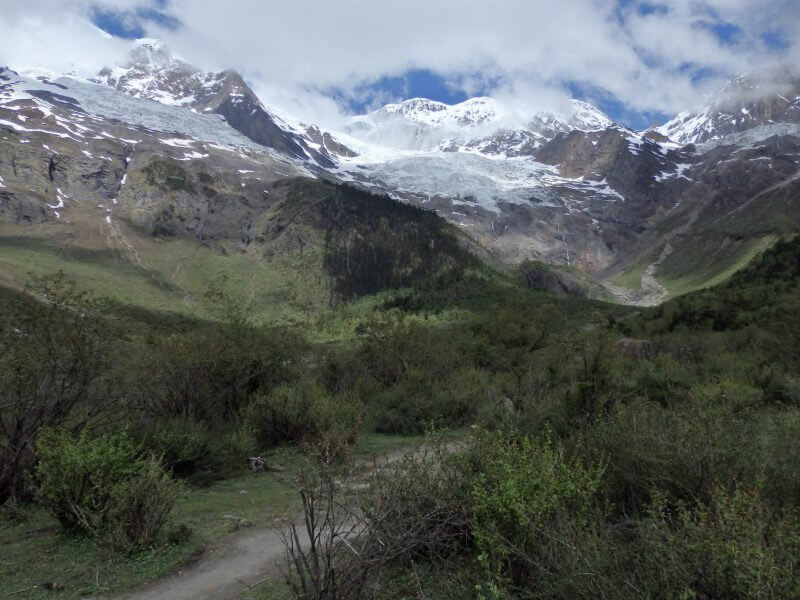 It appeared that our final challenge for us lay ahead, staying alive on the car ride out of the valley. 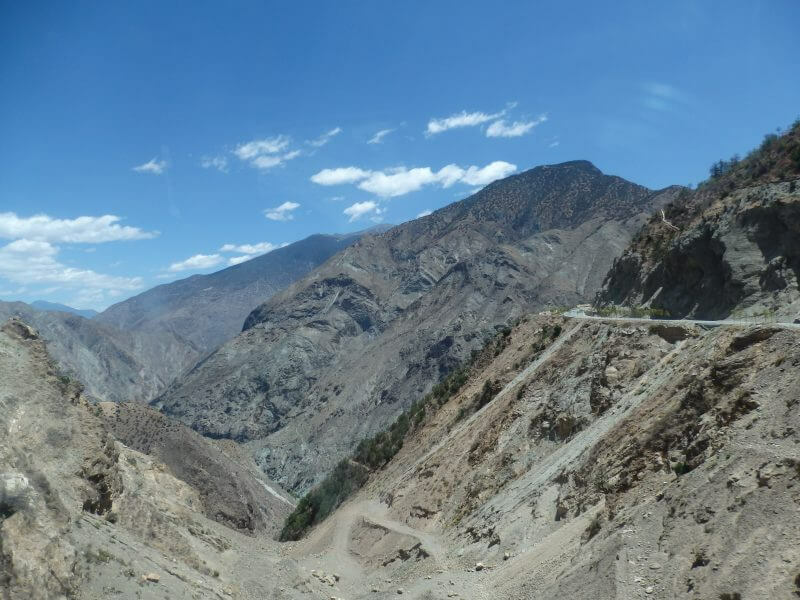 The narrow sandy road vehicles take to leave the valley. Its two-way, by the way. Gladly on the bus, on our way back to civilisation. Grass plains on the highway back to Shangrila. 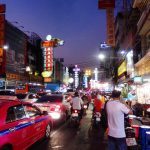 It was around the evening by the time we arrived, and public buses appeared to have stopped, so we took a cab back to the old city, where our hostel was. I was probably too tired, as I can’t remember what we had for dinner, if we had any at all. Back at the Shangrila hostel. 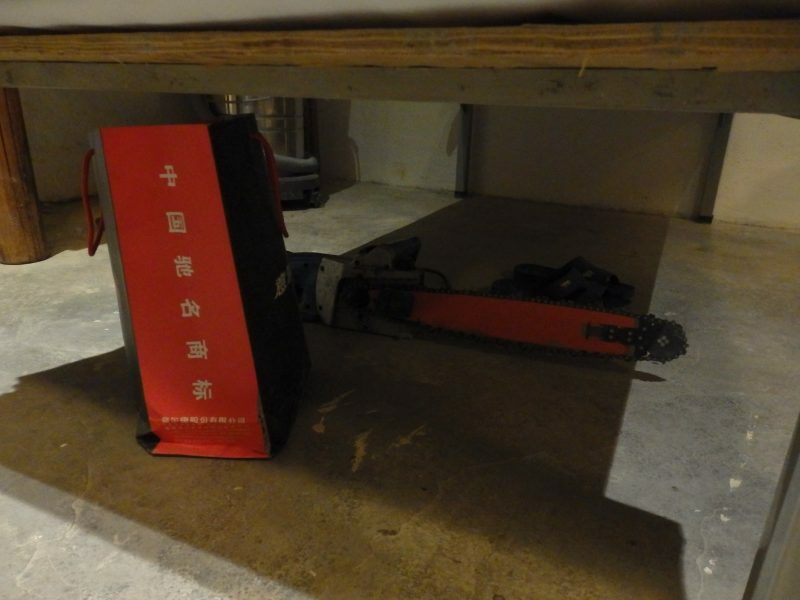 Someone left his/ her chainsaw behind, under my bed. 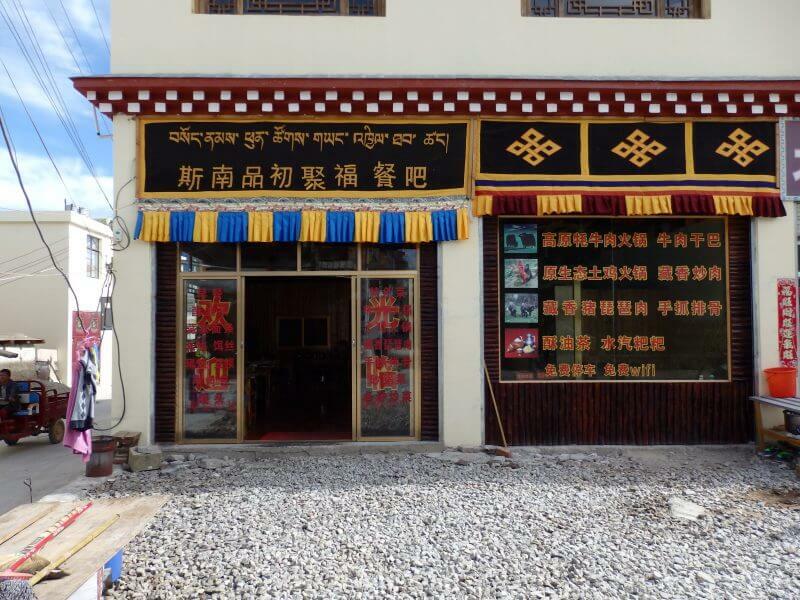 Before our side trip to Yubeng, we had spent a few days in Shangri-la, and there was this restaurant run by a friendly Tibetan guy that we really liked. 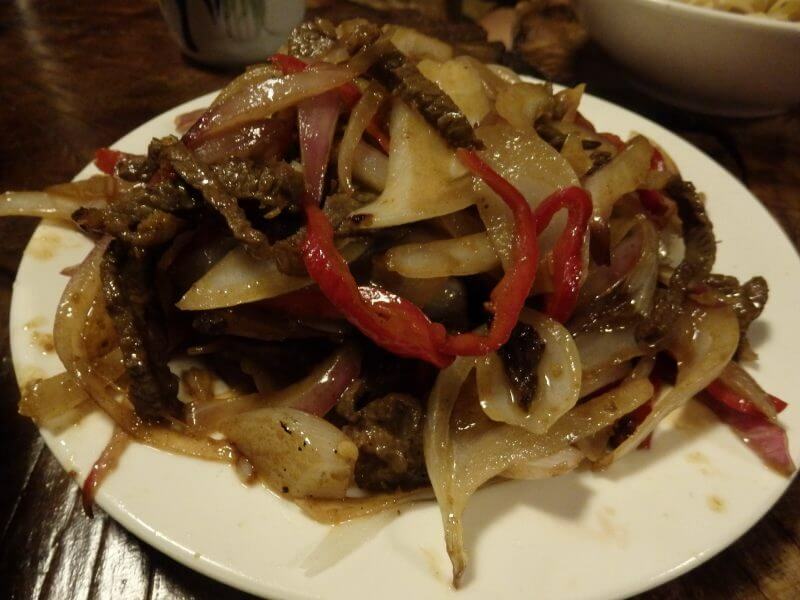 Being back in Shangri-la, we couldn’t help but be back again, for our last chance to meet the friendly old man and try some of his exotic dishes. 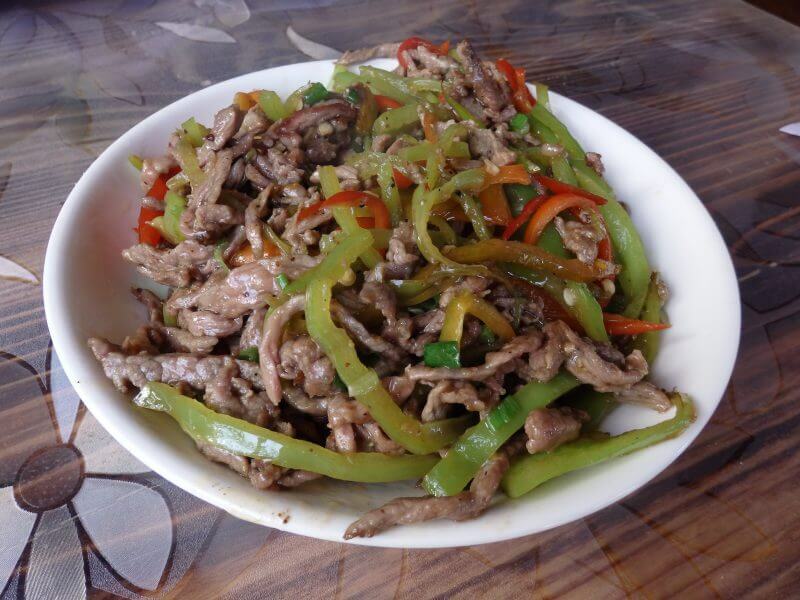 His restaurant can be found just not too far from the Moonlight Square (Yue Guang Guang Chang). The bus (according to schedules I found online) indicated that the bus to Panzhihua, where we were to transfer to the bus to Chengdu (our next stop and my friend’s final stop in China), was to leave in the afternoon, so we chilled at the hostel. Great time for a break too, as we were still tired from the 4 day hike. Rained a little before we left. When we finally got to the bus station, we found out that the bus schedule had changed and we missed the bus for the day to Panzhihua. 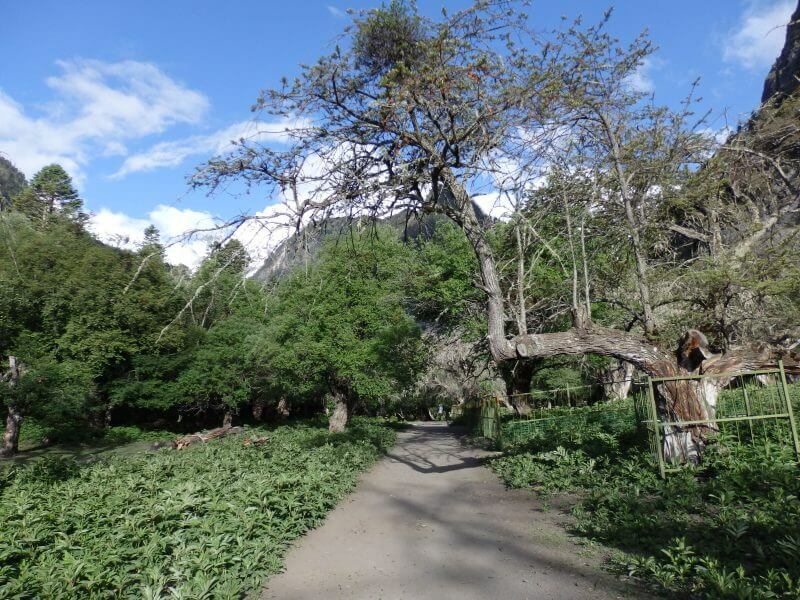 Hiccups like that seem inevitable when travelling slightly off the beaten track, such as the miscommunication over accommodation at Yubeng just a few days back. Despite having known that stuff might not go according to plan, it was a little stressful not having anywhere we could get information from and not knowing what to do, but in the end I decided to take a chance and head back to Lijiang, which was between Shangrila and Chengdu, and hopefully be able to find something to get us to Chengdu there. Left Shangrila happily looking forward to being back in city life (Chengdu), but (slight) trouble awaited at the bus station. 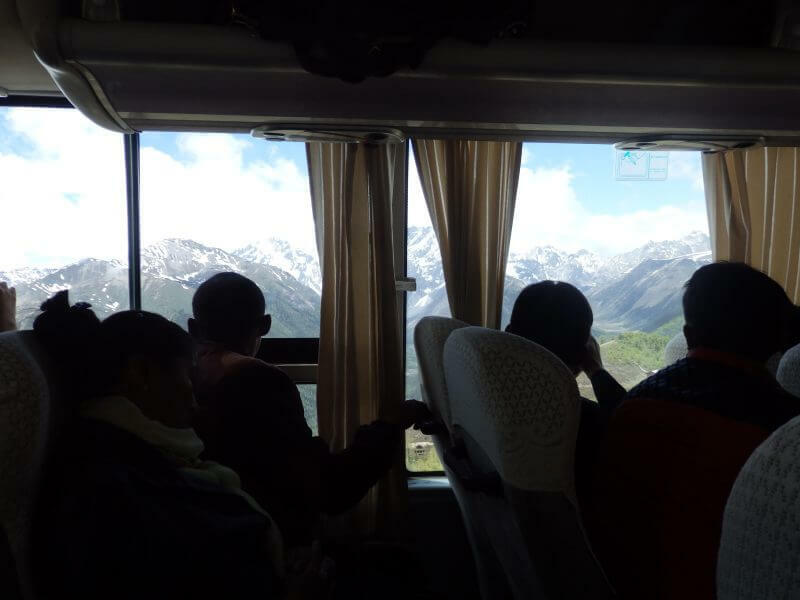 From Lijiang, there was a daily bus to Chengdu, which we had missed by the time we arrived. 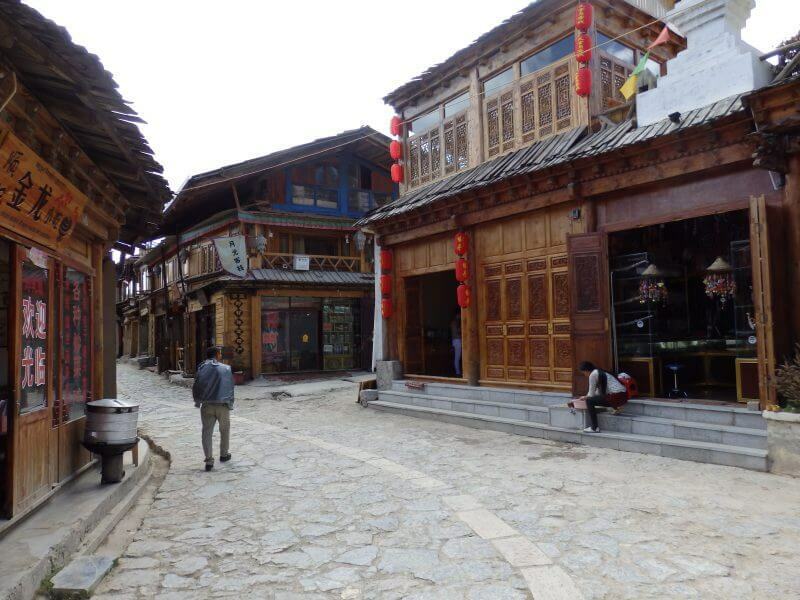 Stayed at night at Lijiang, where we had been before making the trip to Shangri-la and Yubeng, before taking the full day (24hr, no less) bus ride to Chengdu. In all, we arrived in Chengdu a day later than planned, but all else were well, and it wasn’t going to dampen our spirits from having completed a stunning 4 day hike through the mountains! 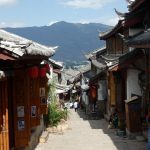 The detour from Lijiang to Shangrila and Yubeng, then back to Shangrila and Lijiang, was worth it, and next we continue our adventures in Chengdu. 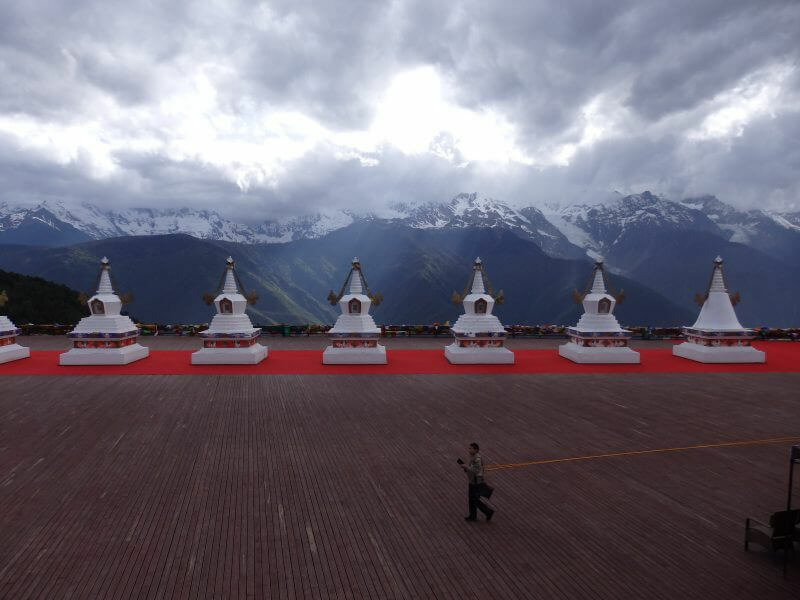 Yup I agree, the Tibetan parts of China feel like a different place. The regions further up North/ West seem less accessible but I think worth the effort to experience totally different cultures and landscapes. Glad you liked the pictures! 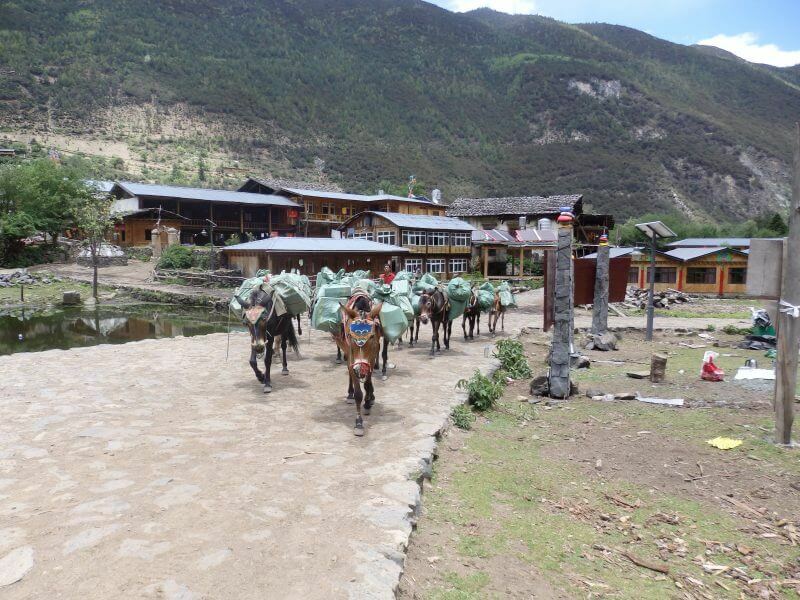 I just got back and checked, we took about 5.5 hours to get from Xidang to Upper Yubeng. Please let me know how your trip goes, and if you need any other information! 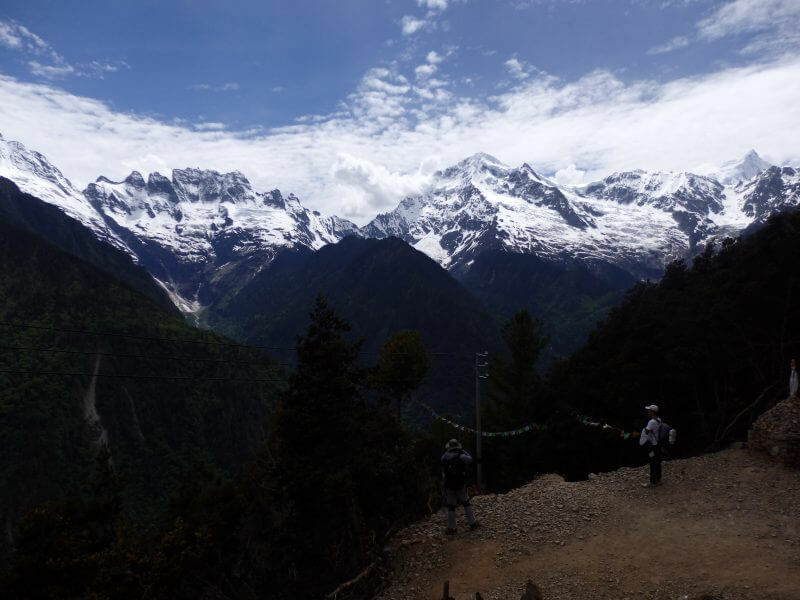 Hey Aaron, I’m looking to emulate your trip to Yubeng, but during Spring Festival next month (weather permitting, let’s see how far I get!). Anyhow, which hostel or hotel did you stay at in Feilaisi? 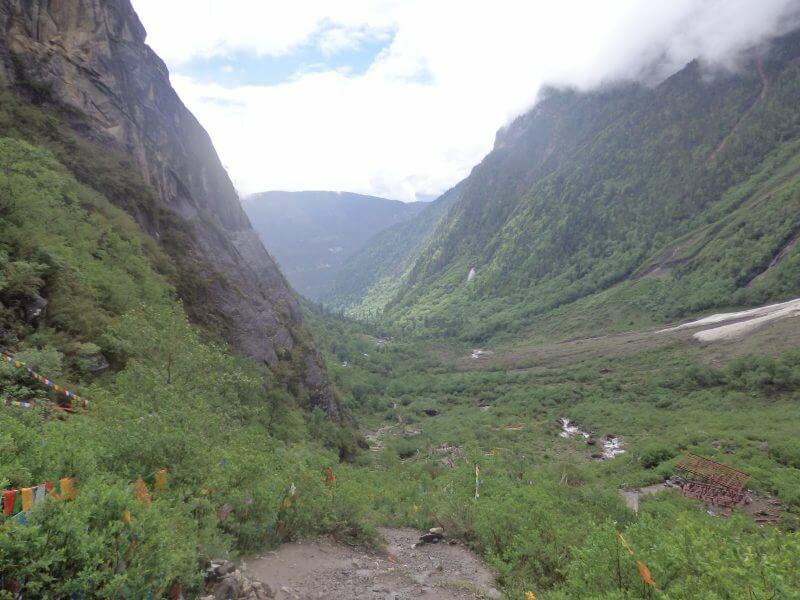 Also, how long did it take for you to hike between Upper Yubeng and Ninong? 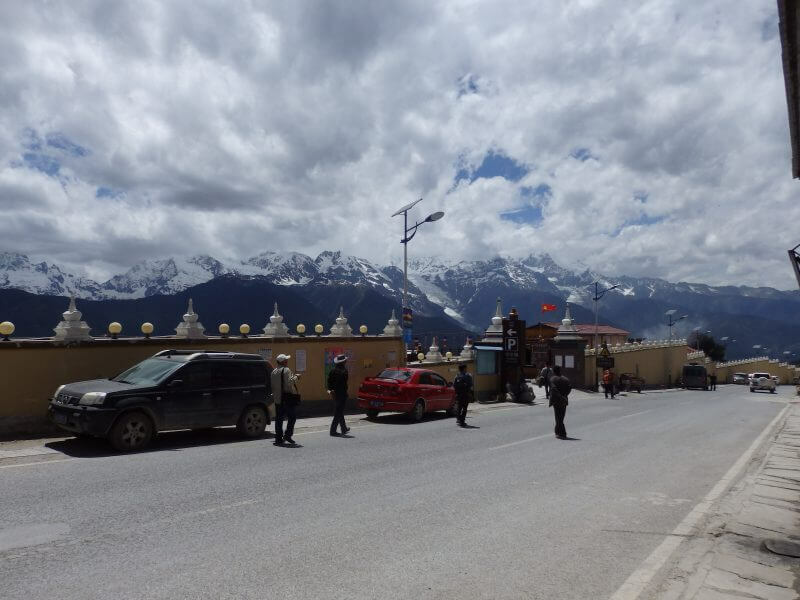 I’m hoping to do Yubeng-Ninong-Deqin-Shangri-la on the penultimate day of my trip, but I don’t want to miss that Deqin-Shangri-la coach. 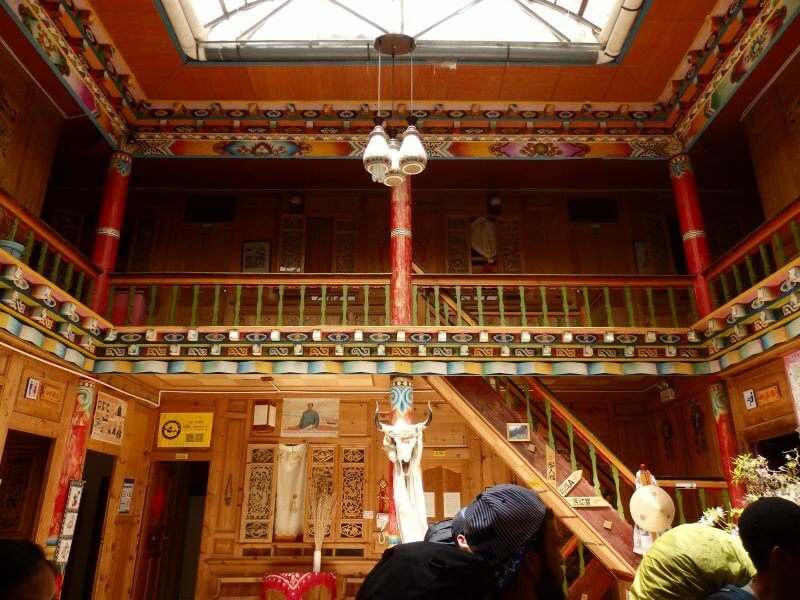 I can’t remember the name of the but I found a picture of the hostel I stayed in at Feilaisi (link). Toilets definitely weren’t looking in good shape when I was there. From Upper Yubeng it’s about an hour to Lower Yubeng, and from Lower Yubeng we took about 4.5 hours for a slow walk out. You should be able to catch the bus, assuming schedules are the same. Hope you’ll have good weather and a great time, cheers!